Final Report for 2012 -- Merry Christmas and Happy New Year! 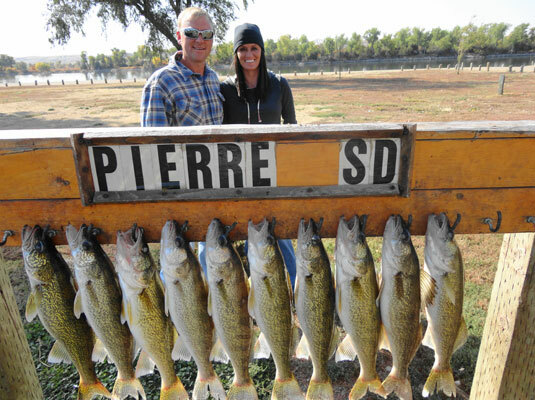 This report will wrap up another great fishing year for both lakes in the Pierre area. The fishing on Sharpe is very good for those warm days or for those fishermen willing to brave the weather. 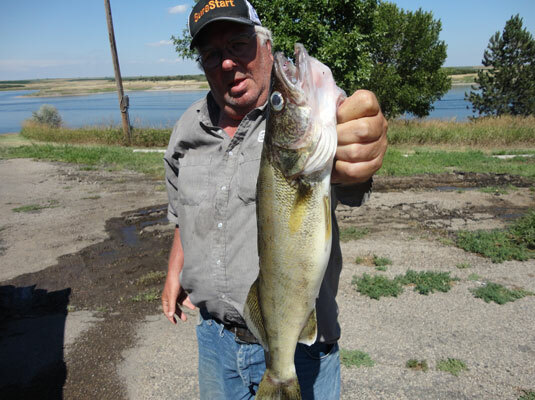 Around the bridges in Pierre up to the tailrace and stilling basin have been putting out limits of walleye mostly on jig/minnow rigs. The same report is true for the big lake especially in the back end of the Cheyenne river. The minniconju ramp is not in use anymore so bush's landing or little bend ramps are the access points pheasant hunting and now goose hunting are both going strong. 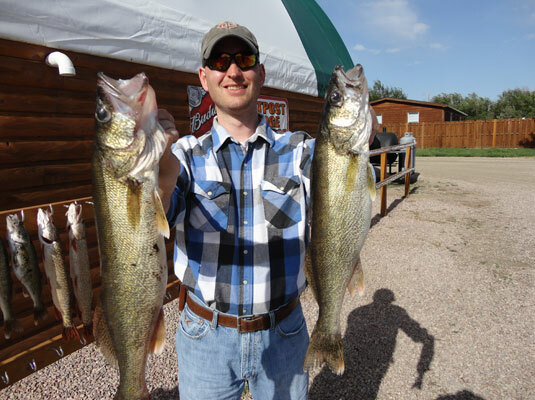 I think next year will continue to be very good and those anglers that enjoy eating the walleye are going to like the new regulations that will allow four bonus walleye under 15 inches a day (8 limit) and 24 walleye in possession if fishing for 3 days or longer. I would like to take this opportunity to thank all of my clients from both this year and years past for the fishing/hunting trips we made and hope that we can go again in the future. If you have already booked a trip with me for next year please verify the date's with me after the first of the year. To all of you that read my reports I hope they have been helpful in some way and to all of you Merry Christmas and Happy New Year. Let's all look forward to a great 2013 and I will see many of you at sports shows this winter. I just will be doing these reports now weekly as the season for the open water fishing here on Oahe winds down .I guided for the outpost customers Rich Rouse and Dan Cooper from Emmetsburg Iowa for one day of pheasant hunting with them shooting there limits and then on a really nice Indian summer day fished the Cheyenne river arm of the lake to there limits of walleye in around the 18 inch range, some smallmouth bass and a small northern pike. A couple of real nice guys and they had a great time both hunting and fishing. We caught most of the walleye on jig/minnow's in 15 to 20 fow and had a slow bite early but a great bite after lunch. Maybe because we got on active fish or maybe because the water warmed up a little later in the day. Was down on Sharpe earlier in the week as well as some of the other guides I work with and the bite there is still spotty and it also seems later in the day. You can get limits most days but if the corps doesn't run the right amount of water it can be harder to come by limits. Jig/minnows seem to be the best baits there also. Water temps on Oahe are in the high 40's now and around that on Sharpe. 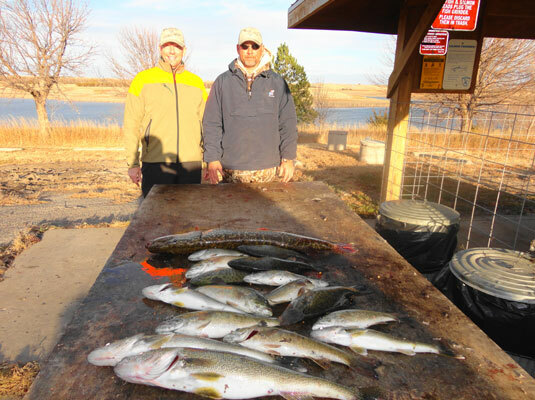 Oahe is still very good fishing especially for those anglers that know the lake and the late season bite continues to be excellent when the weather is excellent. One little tip about cold water fishing that I think is a key to catching more fish. Get your baits away from the boat. The water is cleaner and colder and the fish are more spooky. I also try to never fish in an area with other boats for this reason. If a boat comes into an area you are fishing is is almost better from my viewpoint to just move on as most of the fish well anyway. Many have been fished all year and just won't take a lot of pressure. The boats sitting in the community spots catch a few fish but if you want the really nice catches of bigger numbers and bigger fish try to fish by yourself, cast a long ways away from the boat or drag jigs way back. Most of the best anglers know this and usually are the ones coming in with nicer stringer's of walleye really year around but especially in colder clearer water. I guided along with guide Ne. John a group of hunters from the Denver area that Rich Wilson referred over on Sharpe. 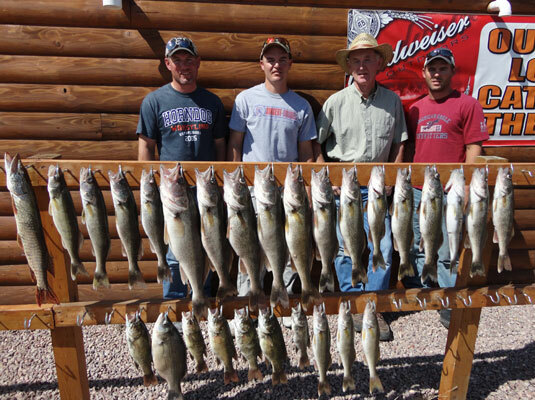 We caught 23 walleye needing 24 for there limits ending up 1 Fish short for there total limit. I believe this is the first time this year that I didn't get limits for my boat indicating the bite is a little tougher at least on the river. Some days can be excellent but some tougher so I will categorize the bite as Spotty. We caught the fish in around 10 fow on bouncer/minnow rigs however plug pulling is a good option right now on Sharpe. Oahe is still going strong when the wind/weather will let you get out on the big lake. Smallmouth/ northern/ walleye are biting in 20 fow or less mostly on jig/ bouncer/minnow rigs with Bush's Landing/Little Bend/ Cheyenne river area's the best choice. It looks like this weekend the weather is going to favor the hunter's as wind/ snow or rain forecast. Next week looks a little better but we are late into the season so the amount of great fishing days on open water are really getting limited. I will continue to post a weekly report at least up to December and if there are any major changes I will post them. In closing I would like to pass on a little humor a friend of mine posted after the election results were in Wednesday. Pete Harsh, one of the best professional fisherman from over in Minnesota writes that it look's like there are getting to be a lot more cheese taker's than there are cheese maker's voting these day's. I laughed when I read that but unfortunately it probably has a ring of truth. Well one way or another we still all live and fish in the USA and that is very good. We are getting some great late fall day's making for combination fishing/hunting trips a lot more pleasant. 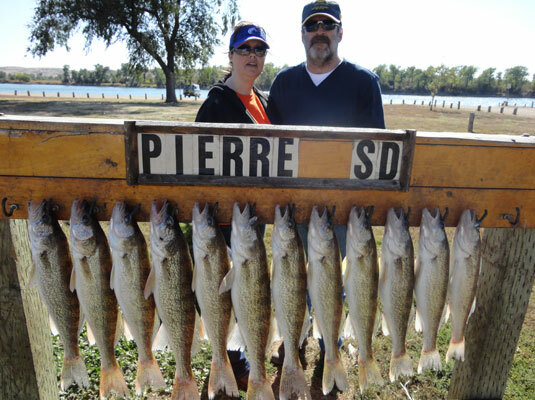 Pheasant hunting is excellent around the Pierre area and the fishing is good but spotty for walleye on Sharpe. 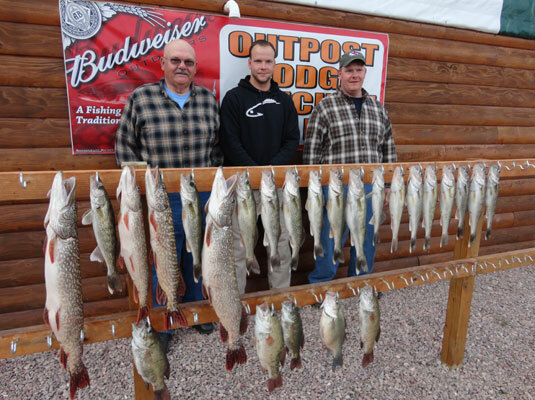 Walleye, smallmouth bass and northern pike on Oahe are going strong. I guided Mark Fitspatrick and friend from Georgia for a day of walleye fishing on Sharpe catching there limit. The bite was slower in the morning hours but turned on after lunch allowing us to get some real nice walleye in around 10 fow on minnow/ bouncer/ jigs but we did catch 3 or 4 fish pulling plugs (flicker shads). The bite on Oahe remains excellent with most fish coming from 20 fow on bouncer/minnows or real shallow (10 fow or less) pitching jigs/gulp/ minnows. 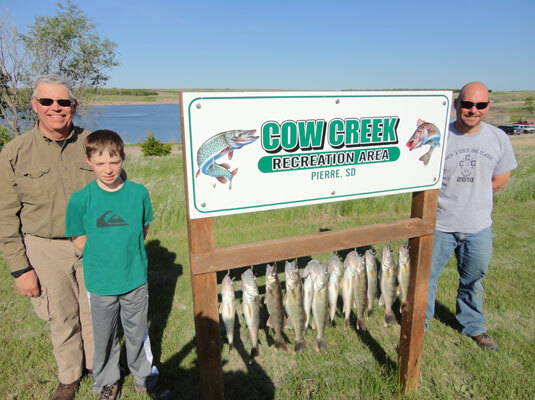 The Cheyenne river and all the way up from Bush's Landing are probably the best choices but many fish are coming from the dam to the spring/cow creek areas also. The weather looks very good for the next week averaging around 50 to 60 degree's all the way up to next weekend so there should be some real happy hunter's and fishermen. I will do another report in around 5 days. 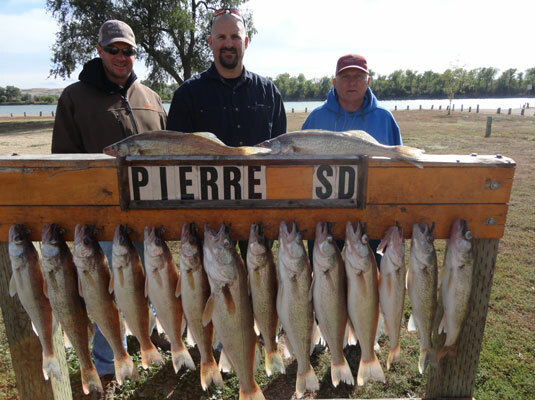 The fall fishing/ hunting in the Pierre area is excellent. 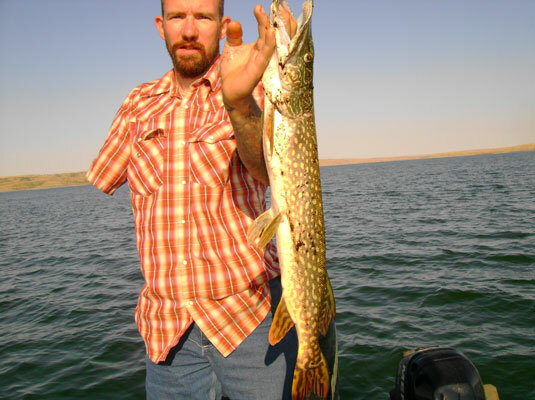 The Lake Oahe northern pike bite has come back on as a lot of these species have moved back along with the walleye/smallmouth bass into the shallow's. The how of it is minnow/Gulp presentations and the where is around the Cow creek/ area to the Cheyenne river/ Bush's Landing area's. Most fish are being taken in 20 fow or less with many coming from less than 10 fow. Sharpe is also good but experience counts as the fishermen who know the system are limiting on just about every outing with nice walleye. Night crawlers still work better on Sharpe some days. I fished Troy Coats and his brother from Missouri to a nice limit of walleye to 24 inches and some big northern to 34 inches and a lot of smallmouth bass. The weather was great and we had a great time. I then hunted and fished the Gordy Sorenson Roberts Pump/Franklin electric group. Once again we had great weather and just a great bunch of guys. 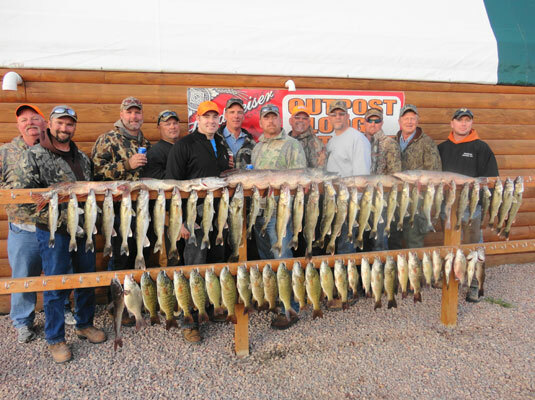 They shot there limit of pheasant's for a half a day and then caught a great bunch of fish with many over walleye and a lot of northern pike (one fish well over 20 Lbs.) and plenty of smallmouth bass. These kind of trips this time of year are a great way to go. I have mentioned weather several time's because it is such a big factor late in the season. If you come to hunt and fish and the weather is bad you can hunt bird's and leave the fishing for another nice day but if the weather is good so is the fishing. Both the groups above got lucky and had those great Indian summer days and for many a trip of a life time both catching fish and shooting limits of birds. It is great for company's like Roberts Pump/ Franklin electric to put on trips like this for there honored employee's and all of us Guides/resort's appreciate the business big time. From me and all the guide's a very big thank you. 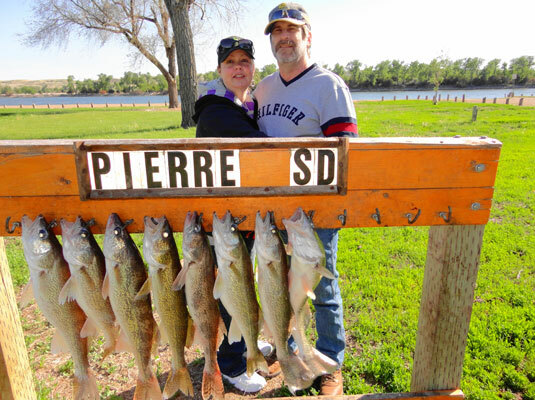 If you can still get over to Pierre and the weather holds the fishing is excellent when the weather is and the pheasant hunting/bird numbers are great. Some geese are in the area but very few are being shot/hunted. I will start with the weather for the rest of this week. It looks like hunting is going to be the best game plan for every one but the real die hard fishermen. Colder temps/wind/rain and even some snow is forecast so I won't be doing a fIshing report again until Sunday unless something changes. I guided a father three son party Dustin McLaren and his boys from Atlantic Iowa to one great day of fishing up in the Cheyenne river on Oahe on there first day and then in rain and wind the next day. 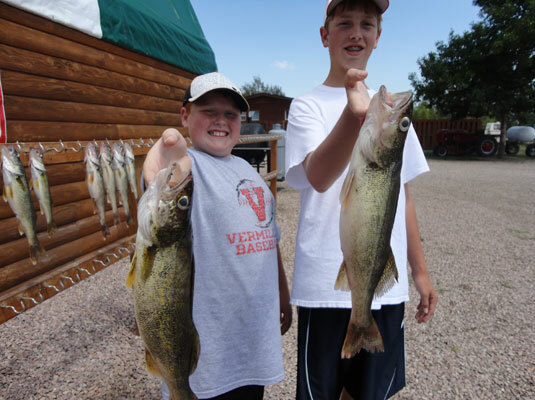 We got real nIce limits of both walleye and bass wIth one boy hauling in a 25 inch whopper walleye so the trip was good for them. Caught all these fish on minnow/bouncer rigs fishing in 15 fow to 20 fow. A real nice bunch of Dad and boys and they all had a great time. The second day the weather moved in and we quit after a few hours. I think thIs time of the year if you are going to come over fishing crossing your fingers for good weather is not a bad idea as from now on out it is probably the biggest factor. Fishing is good when the days are nice but much tougher and you earn your fish when they aren't. 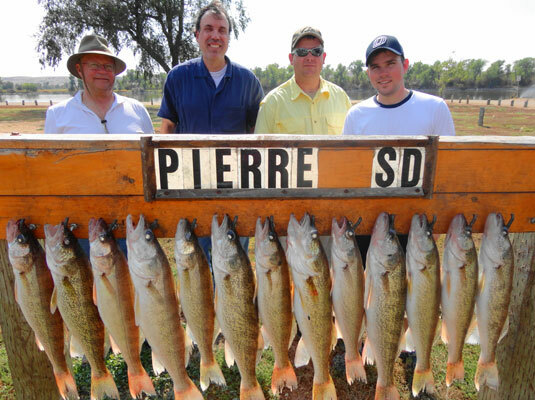 Sharpe around Pierre is still putting out limits of nice fish but working harder for them is not uncommon. Jig/minnow or nightcrawlers are the baits of choice for most and 10 fow seems to be about the right depth most days .Pheasant hunting is in full swing with lots of birds and limits the norm for most hunters. The fishing on Oahe is still excellent when the weather is good. Sharpe is okay but a little slower some days. Weather is starting to be a big factor and Wed and Thursday we had 40 mph winds with 70 mph gusts so any fishing that was done had almost no results as about the only place safe to fish was directly below the dam or not at all. Friday the winds tapered off and I guided repeat customer Troy Swift, Dad, and party from SD to a great day of fishing on Oahe getting limits of walleye and smallmouth. 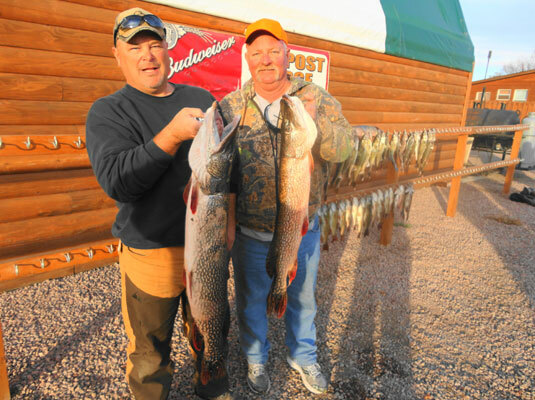 We caught these fish on minnow/bouncer rigs in around 20 fow on Oahe. Had a great time as I always do with this group and the weather cooperated for a nice trip for them. 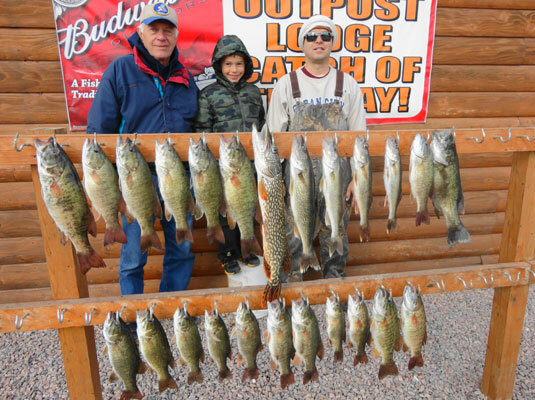 I then took out Father/son Lee and Edgar Pierre from down Omaha way and we did very well catching limits of smallmouth and nice walleye limits with all there over fish every day and one big northern pike that went in around 20lbs.The same thing worked as we stayed on Oahe in around 20 fow with minnows/bouncers. They got their possession limits to take home along with some real nice meals cooked up here at the Outpost. This time of the year most of the pressure on both systems is winding down as hunting starts to get into full swing. Where we fished in three days we saw around 3 or 4 other boats all day. There are a lot of fish being caught by pitching jigs/ gulp/minnows on both Oahe and Sharpe and although some days crawlers work minnow/gulp presentations seem to be the baits of choice for most anglers. 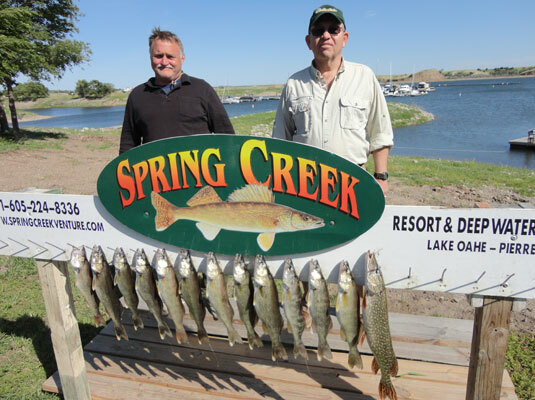 The weekend was absolutely picture perfect weather and the bite on both Oahe and Sharpe remains good to excellent for those fishermen that know the lakes and are good at fishing. Oahe smallmouth fishing is at a peak as these fish have come out of the shallow water and are all over in 10 fow to 25 fow. Minnows/gulp on either bouncer rigs or jig's and even trolling plugs all work for them. 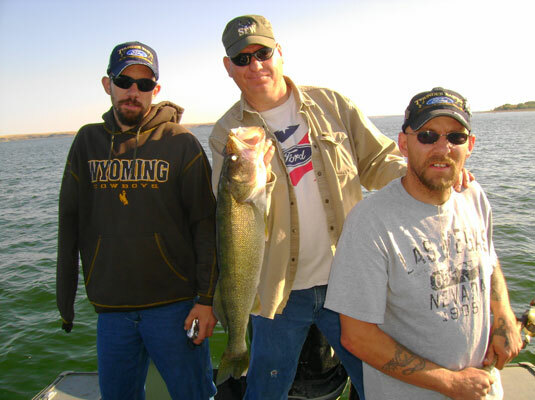 The walleye are there two and all the last trips I have made on Oahe we have come in with limits of both fishing with minnow/plain hook/bouncers staying in around 20 fow. Sharpe is still going good for walleye and nice ones but if they aren't running the right amount of current it can be a little harder to put the fish in the boat. Crawlers are still working but take minnows along as some days they are what the walleye prefer. Jig/minnow's or jig's/ gulp are starting to be the number one presentation on both lake's. My friend Jim Randash from Rapid City sent me the above picture of this 13lb 5 oz walleye he caught while fishing in Tobin Lake, Saskatchewan. Guess they had half a dozen over 10 lb fish but he felt it wasn't as good a trip as in years past catching 15 fish or more last year over 10lbs. 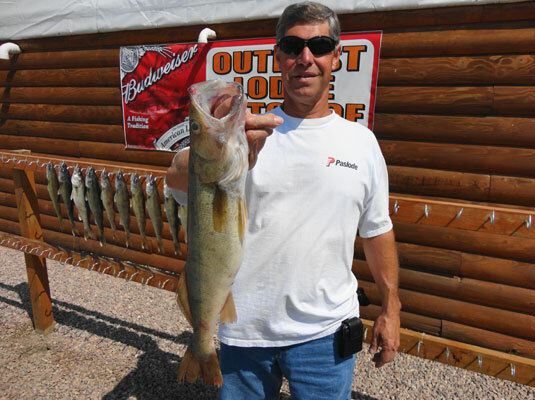 Any way you stack it up it looks like Tobin is still a very good place to go if you are looking for big trophy walleye. It does sound like you need to bring some real warm clothes though as Jim said the weather was plenty cold and wet and they had to earn these fish. 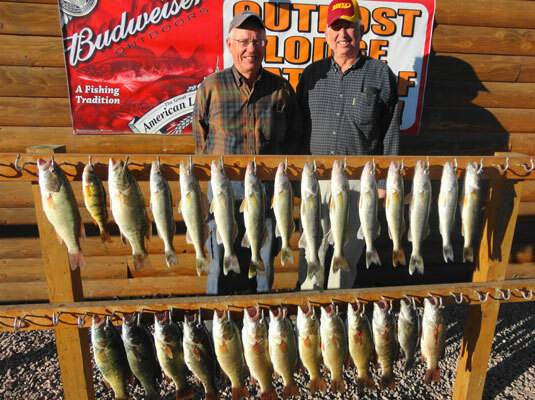 I fished Don Fadley from Iowa and his friend Steve from KC Kansas to possession limits of walleye and smallmouth bass. They had one day of big wind (35 mph) and one real nice day and our catches reflected that struggling in the wind but catching well over 50 fish on the nice day. 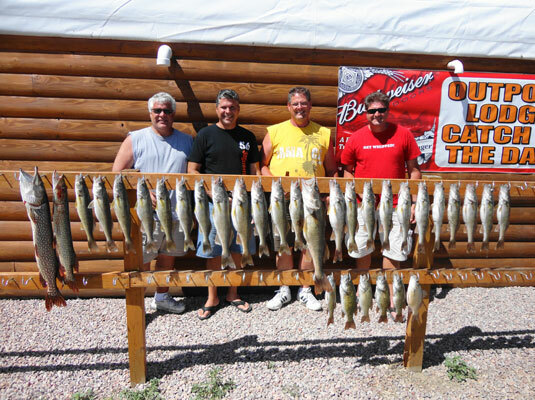 We fished Sharpe on the wind day and Oahe on the next day. On Sharpe we caught the walleye on crawlers staying in 5 to 10 fow and on Oahe we fished with minnows/bouncer's in around 20 fow. There is still a very good bite both places as long as the weather stays nice. I favor fishing Oahe right now especially when I have customers that like catching smallmouth bass (bite is exceptional) along with walleye. If the weather get's tough or walleye are the main goal Sharpe is the best option. GFP had a meeting to address the bait/fish ratio on Oahe last week and as a result are making a proposal to the commissioners to change both daily limits and possession limits for next year along with upping license fee's for park permits by a couple of bucks and small game hunting licenses up $10. I will post the mail I received from GFP on the limit proposal and in general support these changes however it always makes me nervous when the numbers of walleye taken out of the lake increases like this. I felt the same way the first time this was done and was surprised at how well this worked so proven methods are hard to argue with. 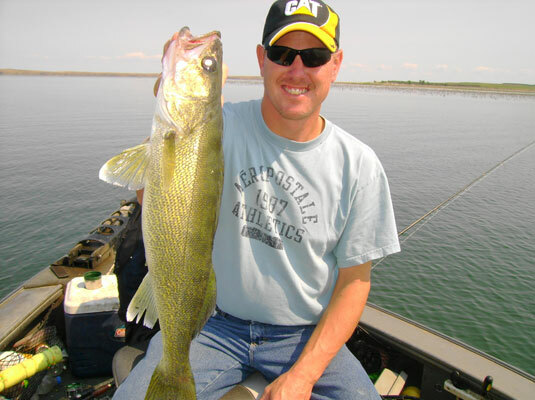 I also believe that I am seeing some stressed fish and less bait now on Oahe along with increased numbers of the 2 to 3 year ago spawn walleye. I think the average angler will look at this as a real bonus and expect the lake to be busy next year. A lot of fishermen are going to go home with a lot of fish dinners. I also support the license fee increases. They are minimal and GFP's spends the money on the fishery's/parks/habitat so even a bigger increase from my viewpoint would be hard to argue with. Following is the proposal and as more information becomes available on all of this I will post it. 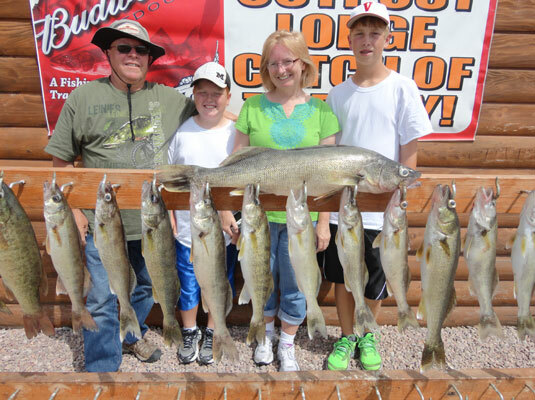 The following proposal is meant to give anglers a bonus due to the record walleye spawns Oahe has had over the last three years and the abundance of these year class fish. It also has the bonus result of reducing mouths in the lake to enhance future bait growth. It has to be approved by the commissioners. 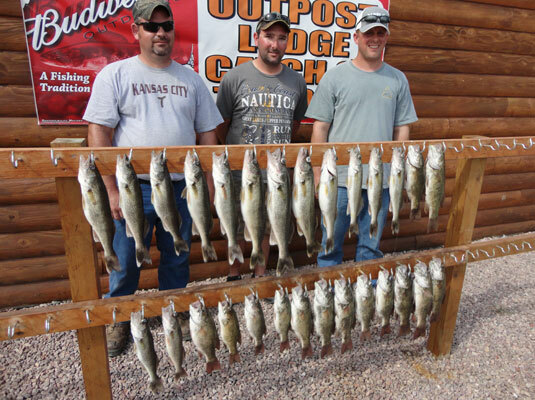 Once again, I would like to thank those who attended the meeting last week to provide input on the recommended changes to Lake Oahe walleye regulations for the upcoming year. 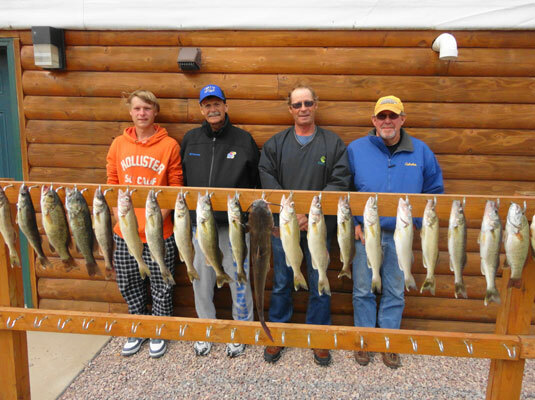 For those unable to make it to the meeting, the recommendation to the commission last week by fisheries staff was to increase the walleye limit on Lake Oahe to 8 per day of which four could be under 15 inches. 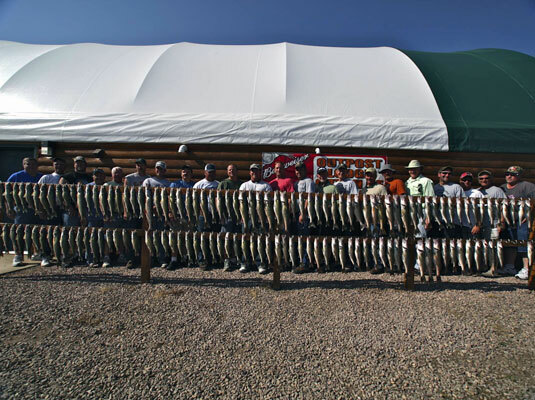 The "one fish over 20" would be removed also and the possession limit would be increased to 24. The commission officially proposed the regulation change on Friday of last week. 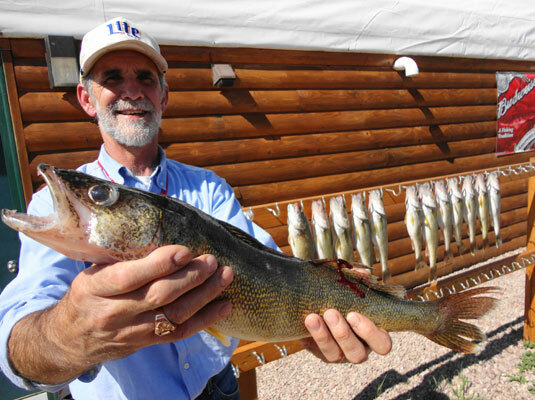 If you (or other interested parties) wish to provide comments either supporting or opposing the Oahe walleye regulation change or any of the other proposals, you may do so by sending your comments to Game, Fish and Parks at Wildinfo@state.sd.us. You must include your name and address to have your comments entered as part of the public record. Your comments will be shared with the GFP Commission as part of the public testimony on these issues. You may also provide comments during the public forum on November 1 at the commission meeting at 2PM in Madison. If you have questions or comments for fisheries staff we can be reached at the following numbers. Thanks again for your participation in this process! To start with I am going to mention that as the fishing season winds down I will be posting my reports around every five days or so. GFP's did have another meeting last Tuesday and I will pass some of that info on this week. 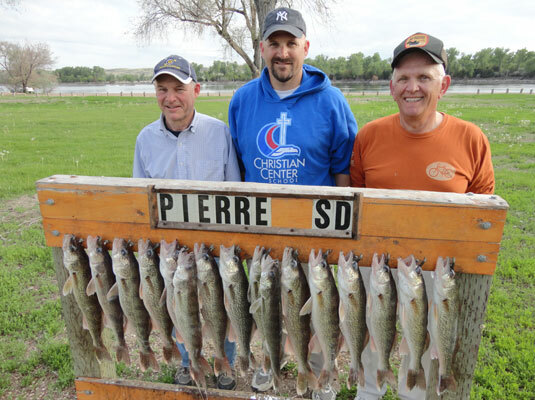 The fishing around Pierre is still staying about the same on Oahe with walleye, northern scattered and smallmouth going strong. The nights are starting to get colder and I noticed today the surface temp on Oahe was in the high 50's so as this comes down some nice walleye should start to come in from shallow water jig pitching and some lead core pulling for the deeper fish. 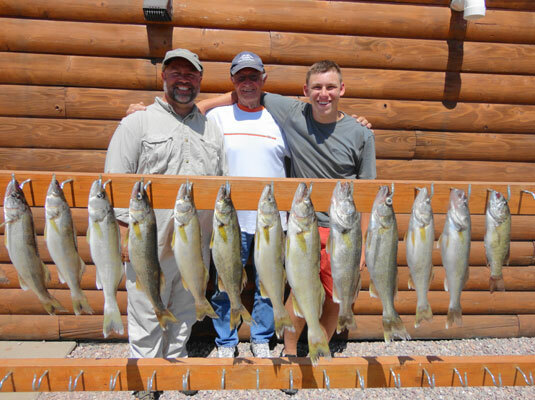 I guided a father/son/father in law the Rodrivyez's from Sioux Falls and Michigan to limits of walleye on Sharpe and then limits of smallmouth bass with some walleye and a northern on Oahe on day two. I Had a good time with this family and they got a little colder days in the 50's but nice other than that. We caught the walleye on Sharpe in 10 fow on both crawlers and minnows with bouncers but I think my next trip out I am going to put some jigs/minnows down as the water temps are coming down. 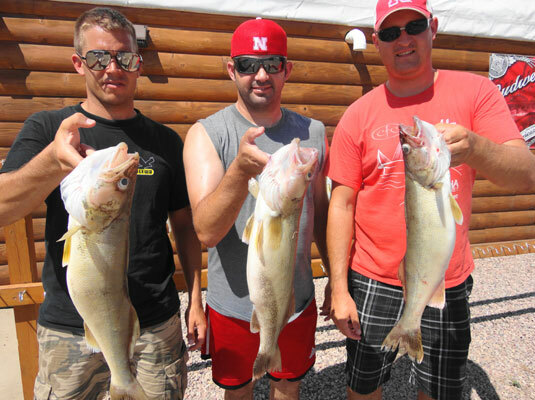 We caught the smallmouth/walleye on Oahe on minnow bouncer rigs in around 20 fow. Got some wind coming in the next few days but the week end look's ok. 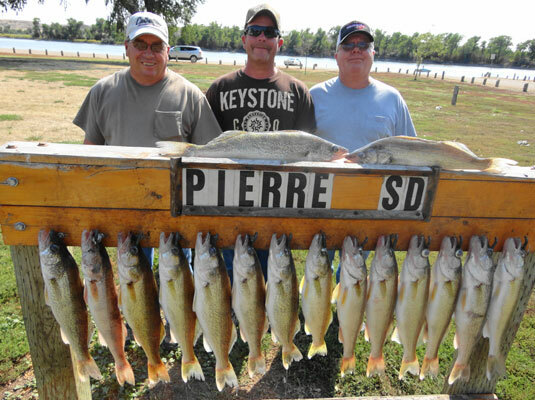 The fishing on Sharpe around Pierre is maintaining a steady catch rate of nice walleye in the 15 inch to 19 inch range with some over 20 inchers in a few daily limits. Once again for the fishermen who know the holes or area's to fish, limits are the norm with many guide boats catching 20 to 30 fish a day and keeping the nicer ones. For me the bite here has still been on crawlers but I am aware that some boats are doing well on minnows or shallow running plugs trolled. Here my favorite is a Berkeley flicker shad usually in just pearl white. 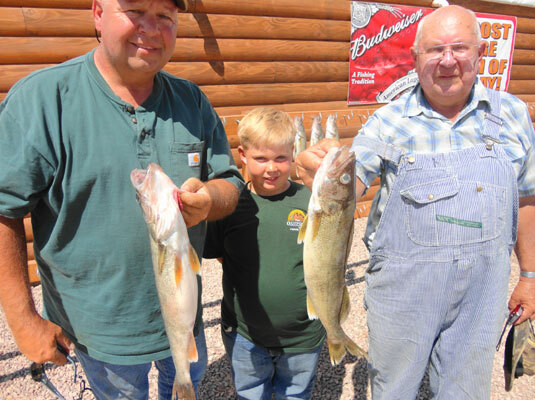 Some anglers fishing in community spot's struggle to catch a lot of fish and more of the smaller walleye but that is due to heavy fishing pressure reducing numbers of quality fish. Traveling to area's with less fishing pressure usually pays off. 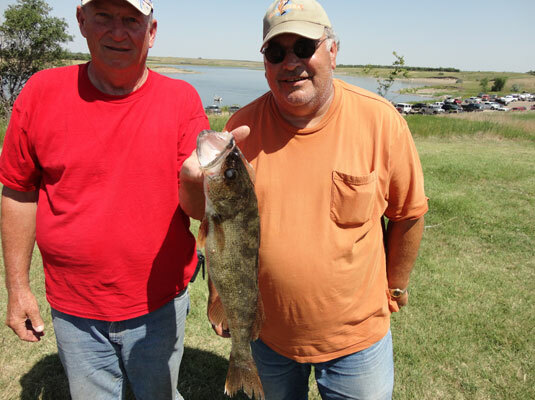 Oahe is still doing just great on smallmouth (around 10 to 20 fow) but nicer walleye are scattered. Here again guides or local fishermen that know the lake are coming in with plenty of fish. 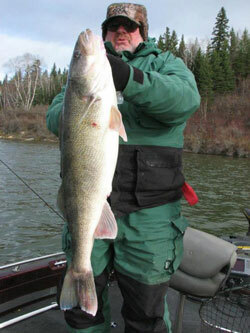 Pitching jigs/gulp is sure worth a try in many areas but there are still a lot of walleyes way out deep chasing smelt. 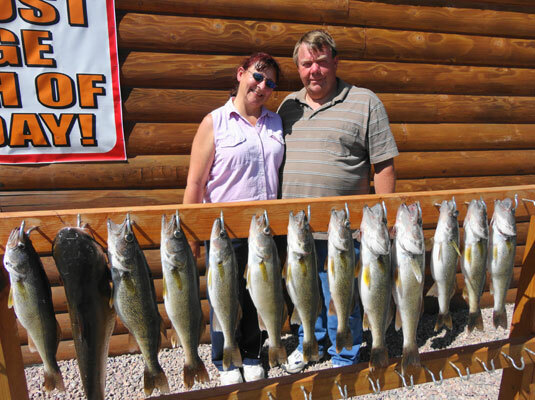 I guided a real nice couple from Redfield SD to a nice limit of walleye avg. 17 inches on Sharpe. 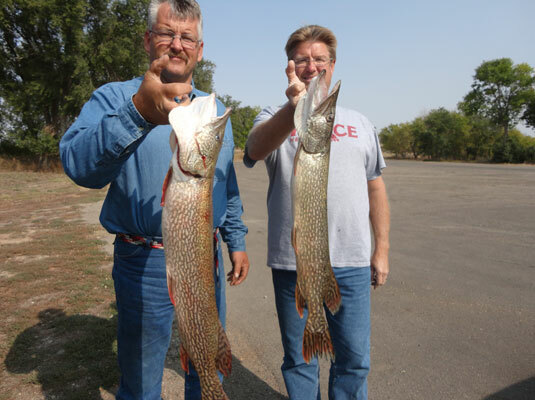 We caught these fish way East of Pierre in 10 fow on nightcrawler/ Bouncer rigs. Kelly and Amber Siebrect came over to Pierre to celebrate a wedding anniversary and decided to make a part of that a walleye trip and they had a great time getting nice weather and nice fishing Great couple and once again I got real lucky having the chance to guide them. The fall weather has been excellent and the fishing is good. Not a bad time to sneak off if you can. 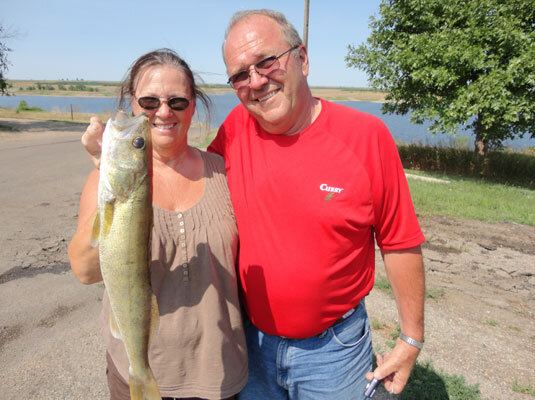 I guided Tom and Lizzie Lundgren a nice couple from Morrill NE to possession limits of walleye and smallmouth bass fishing on Oahe one day and Sharpe one day. We caught limits of walleye on Sharpe in around 10 fow and since Tom expressed a desire to catch smallmouth bass we went after them on day two on Oahe finishing out their possession limit of walleye and then catching probably 30 to 40 smallmouth in the 3 lb range. Smallmouth are biting real good on Oahe favoring minnows or gulp/jigs and they are all over but we caught most of them in around 10 to 20 fow I then took a father son Fuzz and Matt Henry a repeat customer from Norfolk NE and Rapid City on Sharpe. Another great trip with a couple of real great guys. 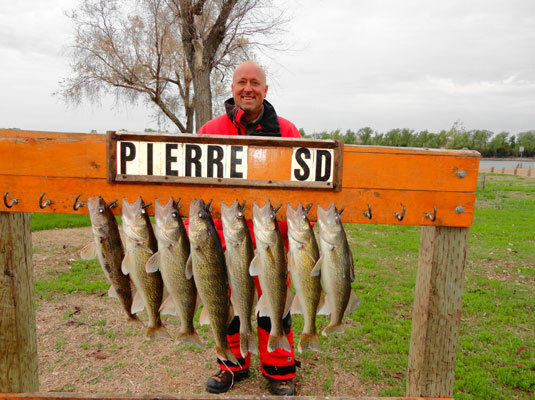 We fished south of Pierre out running most of the boat traffic and caught some really nice walleye throwing back 15 inch fish keeping just fish in the 17 to 19 inch range. We caught these fish in around 10 fow on night crawlers but minnows work. Plug fishing also works but floating weeds can be troublesome. 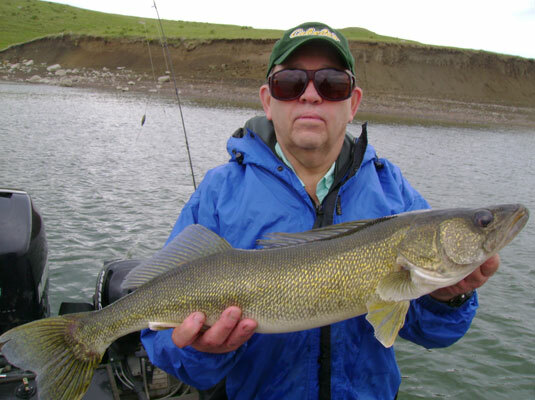 The bite on Sharpe remains excellent for those knowing the river, excellent for smallmouth on Oahe but walleye can be challenging some days on Oahe due to lowering water levels scattering the fish to a lot of different water depths. Don't be afraid to pitch jigs shallow on Oahe. I know of many over 20 inch fish being caught that way by guys willing to work a little harder. Just great fall weather all week but look for a little cooler temps next week. I guided the Sapp group from mostly down NE way along with other guides to limits of fish both days. 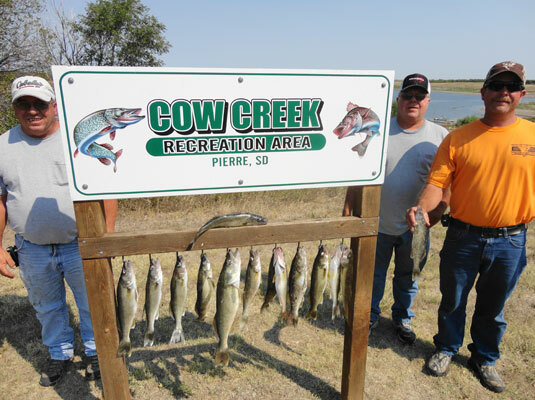 We stayed on Oahe and fished north of cow creek one day and south the 2nd day fishing in 10 fow or less day one and around 35 fow day two. We used crawler/spinners or bouncer/plain hook crawlers both days and did fill our limits with several over fish but worked for the fish both days. Some of the other guides fished down on Sharpe and for the most part caught limits but worked for them there too. I would say right now the bite is alright in the Pierre area but tougher than it has been. 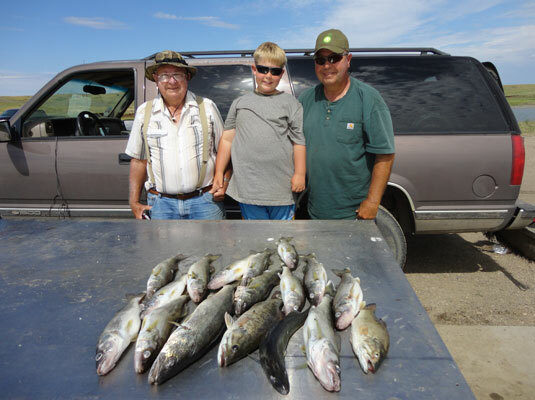 The lowering water levels on Oahe have scattered the bait and as a result the fish are harder to find. They can be shallow were bait is present or clear out to 70 fow or more when they are chasing smelt deep. I am not sure why Sharpe got tougher but it could be a combination of lowering water temps, fishing pressure or not the right amount of current discharges daily but as more fish move up the river the bite should continue to put out limits for those who know the river and fishermen that are working a little harder. Most boats going out around Pierre are still catching fish in 10 fow and using minnows is starting to be very good. Night crawlers are probably the first choice right now but that is changing daily. The fall weather has been really nice and it looks to be that way for the next week. Fishing might be getting a little tougher around town with fewer boats limiting out. I think people that know both Oahe and Sharpe and are moving around a bit are still catching limits and I think as the nights cool the bite will come back on but right now you have to work a little harder to get your fish .I fished the Dakota Mart group along with other guides for the Outpost Lodge and the highlight of the trip for one of the group in my boat was catching a giant big mouth carp (26 lbs) that bent my net. We caught fish but had to work for them. Then I took out two fellows from down Omaha way for the Outpost and we got them there possession limits of fish to take home and also a nice meal of walleye to eat here .Fished on Sharpe 1 day and Oahe 1 day with both of these groups and caught the fish on Sharpe and Oahe in 10 fow or less on crawler/bouncer rigs but I think I am going to start taking some minnows along now as the night's cool the water temps down. One nice thing about Oahe was the fact that we only saw a couple of other boats both days so from that aspect right now Oahe gets the edge. Sharpe is still putting out nicer slot fish overall. Some real beautiful fall day's this week and fishing is still good so if you are coming over you should do just fine. There is a good bite going on in the back of any creek arms on Oahe that have a lot of bait present. Most of these fish are shallow from 10 fow to 20 fow and are being caught mostly on crawler/gulp presentations. A lot of these walleye are smaller 14 incher's but enough big fish are there to make looking around shallow worth the time. There are a lot less boats fishing Oahe right now as the bite on Sharpe is real good making most of the fishing pressure there. I spent a day fishing with Rocky and Kim May then fished repeat customer Troy Swift and crew and then fished repeat customers Chuck and Sonja Harkins all on Lake Sharpe. On all of these trips we had great fall weather and great fishing catching limits daily and getting plenty of action. 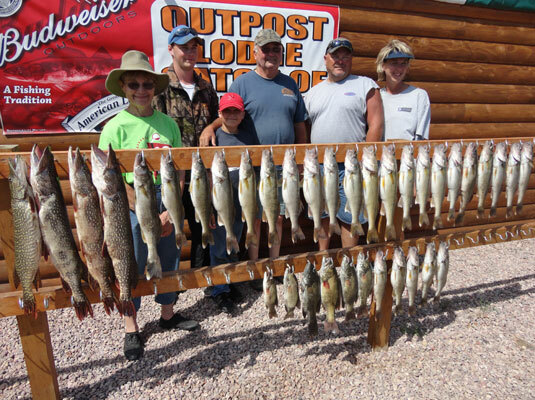 We had at least a 17 inch avg size walleye in all the limits with many over 20 inch fish. 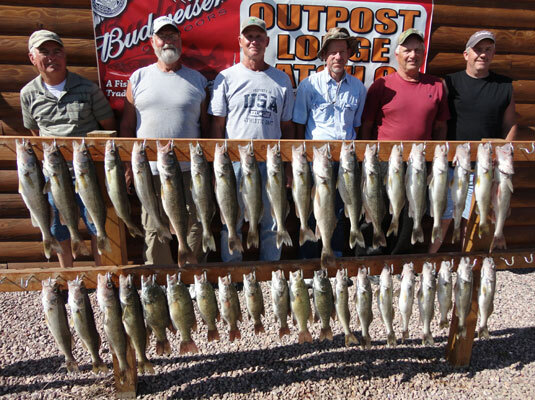 We caught all of these fish on spinner/bouncer rigs using night crawlers for bait. 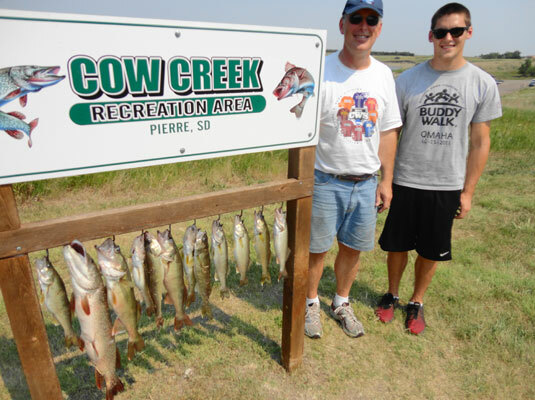 We fished in 10 fow or less along weed lines or sand bars south of Pierre. Most baits are working (minnows, Gulp etc.) and pulling plugs is alright except floating grass on Sharpe make's that tougher. If this is your first trip on Sharpe this year or Oahe take your time as new sand bars etc. are around on Sharpe and lower water on Oahe can make for unwanted surprises if you get in a hurry. 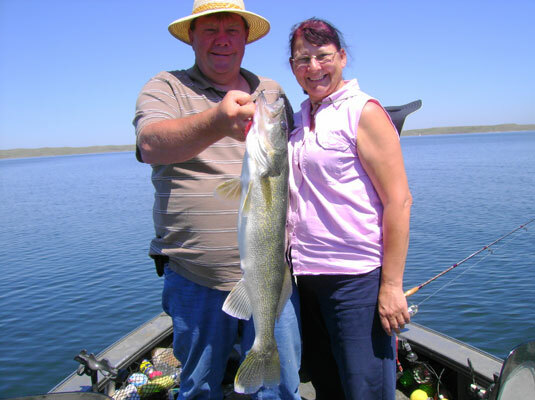 Fishing is very good on both lakes and should get even better especially on Oahe as night's cool lowering water temps and bringing more fish up shallow. 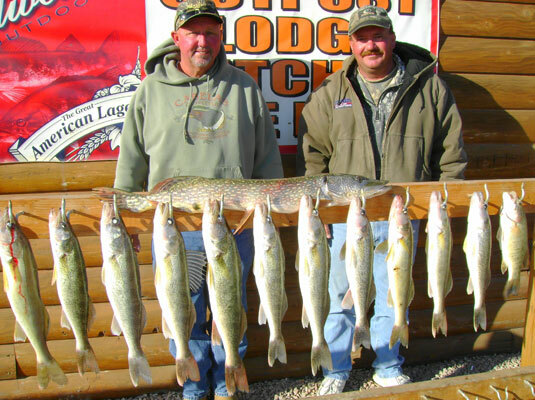 The fall bite is in full swing on Lake Sharpe with limits of walleye in the 16 inch to 18 inch range common for most boats. The fish are all over but the majority of the fish coming from around 8 fow along weed lines/sand bars. 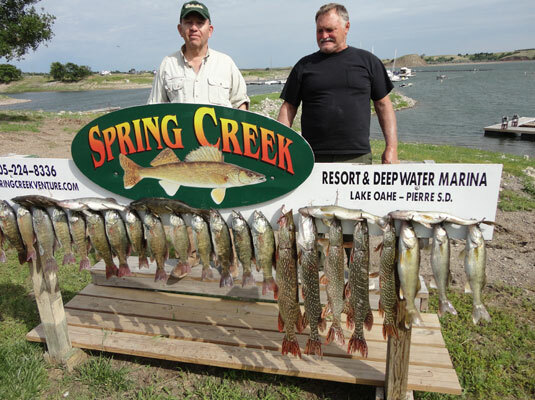 Lake Oahe is also still very good and a good number of fish are coming back up shallow making for catching them in 20 fow or less real possible especially in the back of creeks that have a lot of bait present. I fished the 2nd group of guys Lonnie Wann of the Agri Grow Corp brings up annually mostly from down NE way. A great bunch of guys and they had a great trip taking home possession limits of walleye, some northern pike and a good amount of smallmouth bass. 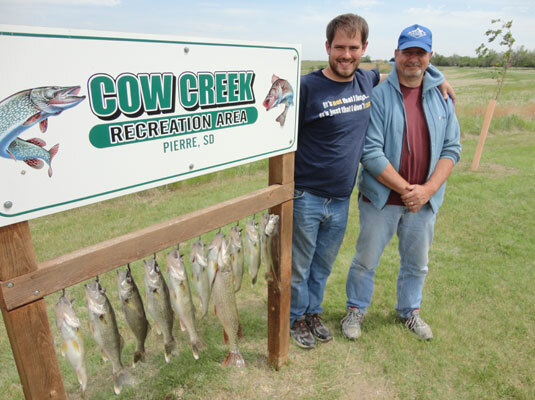 We fished two days on Sharpe and one day in the Cheyenne river arm of Oahe and we caught a least 50 fish a day or more in both places. I was using spinner/bouncer rigs with crawlers and had guides Dave Spaid and NE John helping me and they used gulp on plain hooks or crawlers and all boats caught fish all day long all three days. Many presentations are working from minnow fishing to pulling plugs but on Sharpe due to a lot of floating weeds I think the live bait fishing is better but even then you have to clean plenty of grass off of the bouncers. 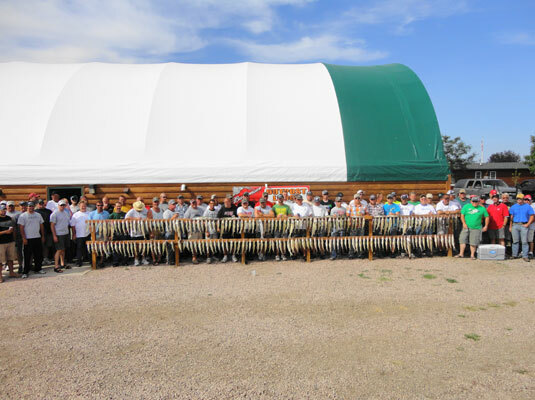 The weather has been picture perfect making for a lot of real happy anglers. As good as it is I think it will get even better as water temps cool with 30 degree nights coming. Be prepared to fish around other boats as the week ends are real busy on Sharpe. If that bothers you you can catch plenty of fish on Oahe and boat traffic is minimal. A tip on Oahe. Look in the back of big creek arms for bait fish and if they are present the walleye will be there and in shallow water (10fow or less). I have been out of pocket for a few days so got a little behind on the fishing reports but not a lot has changed in the first week of September. 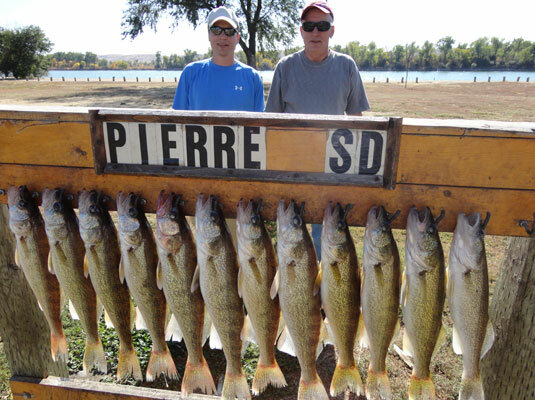 The bite down on Lake Sharpe is still very good in the Pierre area with limits of walleye the norm. Most fish are coming in 10 fow or less and relating to weed lines and sand bars. I have been fishing with spinner/bouncer rigs using either gulp worms or night crawler however plug fishing and minnow's for bait are both good. 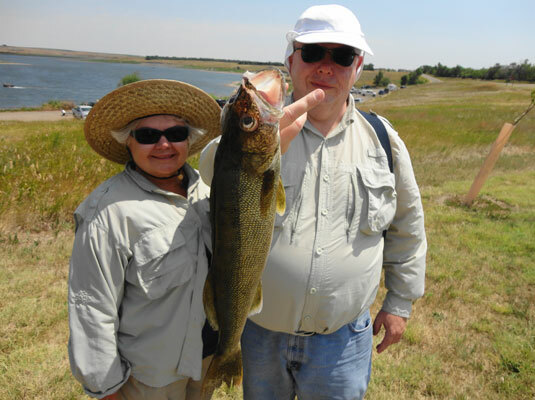 Oahe fishing is much harder for numbers of quality slot fish but plenty of over 20 inch fish are still being caught. A lot of the fish are deep along ledges near the main channel chasing bait down as deep as 50 foot or more but I heard of some fish starting to come back up around 18 to 20 fow so it makes finding them tougher as they are all over. 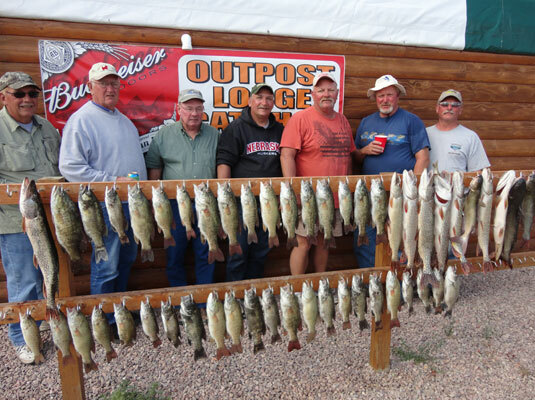 I helped guide a large group of real nice guys and gals for the Outpost taking the boss of the group Bob in my boat and we did alright on the lake and also on the river catching limits both days with the biggest a 24 1/2 incher Bob caught on Oahe in 70 fow. I then guided the Jim Beck group of guys from the Omaha area to limits on Sharpe. These fellows are repeat customers of mine and we just had a great time and caught some real nice quality walleye's keeping an easy 17 inch avg size fish both days. We caught them in 7 fow along weed lines with spinner crawler rigs. 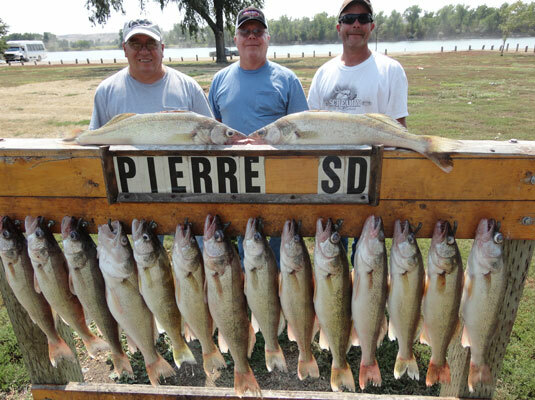 We had at least 10 fish a day over 18 inches so if you get in the right area's around Pierre you can take some nice fish home. A tip Just keep traveling until you run out of boats and try and fish areas that have had less fishing pressure. It will pay off in much nicer over all size fish and for me it is much easier fishing when you don't have to look out for other boats to avoid. Can be hard to do on week ends but if you are willing to put out a little more gas money it sure can be done and there are fish all the way down Sharpe clear to the bend area. I think we are going to have a very good fall bite on both Oahe and Sharpe. As the fall weather starts to cool water temps and bring the fish back up shallow on Oahe it should get real good again especially in the big spawning arms as fish stage for the spring run. I will continue to report on more of an every 3 to 5 day period as the season winds down but will report any big changes more often if needed. 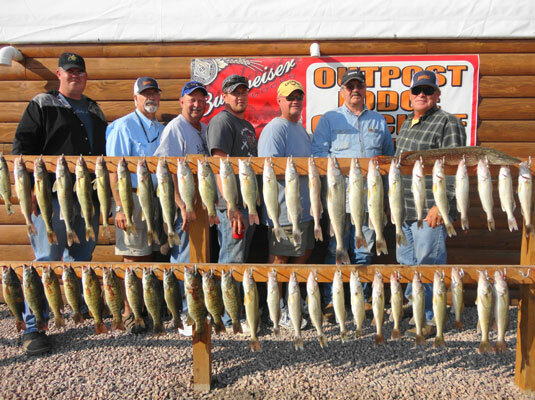 Lake Oahe is still going strong for numbers of the smaller fish with the avg. small slot fish in most limits around 15 inch's but most stringers include plenty of over 20 inch fish for those fishing in the right depths. That is deep so don't be afraid to get out in 40 fow or more to catch fish. Sharpe is in the full late summer/fall pattern with a lot of the fish coming out of the weeds and becoming more catchable. The bite on both lakes for me is still crawler/spinner or plain hook bouncer rigs but a lot of ways are working both places with plug fishing, minnow fishing, gulp fishing all filling limits. I fished the Sederlin group Steve, Doug and Gary from Kansas to limits of fish every day catching at least 50 fish a day on both lakes. These guys come every year as well as the next bunch of fellows the Lonnie Wann Agri Gro Group and in both cases I have a great time and so do all of them. Fished both of these groups for 1 day on Sharpe and then one day on the river and gave them there choice of spots for the third day and both groups took the river for the last day but it is a real close call right now as both are excellent fishing. The slot fish are nicer on Sharpe with an easy 17 inch limits avg. but there are more over's on Oahe coming in. 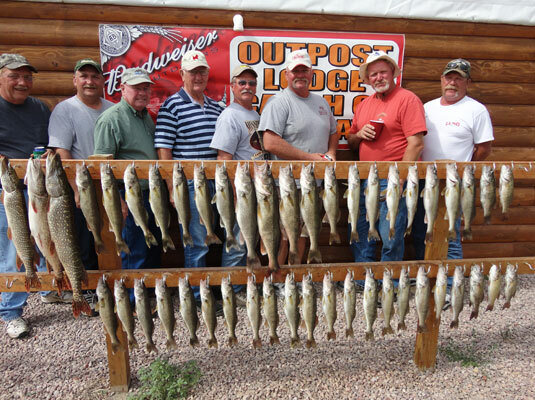 Limits for both groups and eating plenty of fish at night for appetizers made for great trips for all of these guys. 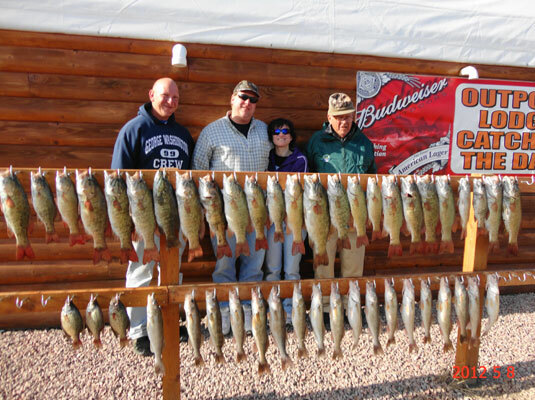 Lonnie Wann's group put on a little tournament on the first two days and guide Dave Spaid won it on Oahe Day one with 16 lbs of fish including 4 over's and I won it on Sharpe with around 14 lbs day two Having no over's but a lot of 18 inchers. That is the story with the fish on Qahe coming from 50 fow and the ones on Sharpe coming from 7 fow so take your pick as you will catch plenty of fish on either Lake right now. Fishing is still about the same on Oahe with a lot of the over 20 inch fish being caught down as deep as 50 fow or even more. There are still numbers coming in with plenty of big fish but the avg size of the under 20 inch fish has diminished some to maybe keeping fish around 15 to 16 inch's the norm on Oahe. All ways are still catching the fish but my way has been to stick with spinner/crawler or plain hook/crawler/bouncer rigs. I guided the Jeff Hupka group from NE. to their limits on Oahe then started out guiding the Sederlin group from down Kansas way to their limits of nice fish on Sharpe. We caught a lot of fish and kept a nice 17 inch avg. pulling spinner/crawler rigs in 10 fow or less. The bite on Sharpe is in full swing for those that know the river and most boats are coming in with limits on both Sharpe and on Oahe in the Pierre area so you can take you pick of fishery's. 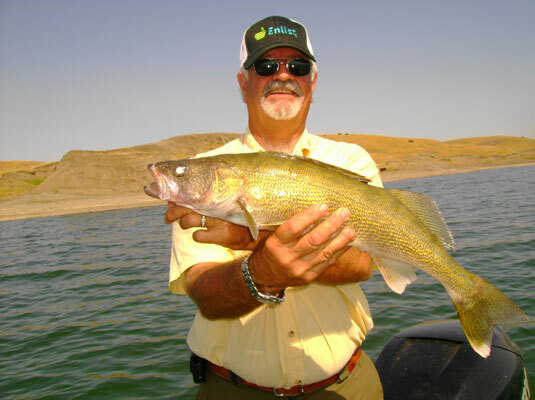 On both lakes if you haven't fished for a while it is a very good idea to keep your eye's on your depth finders as lower water levels daily on Oahe and lots of new sand bars on Sharpe can cause problems if you get a little careless. Fishing has been very good along with great weather the last week. I finished helping Dave Spaid guide the Capitol motors group from mostly Wyoming and then went on to help the Outpost Lodge along with around 20 other guides to guide the first half of the annual trip of Central Valley Ag from all over Nebraska. 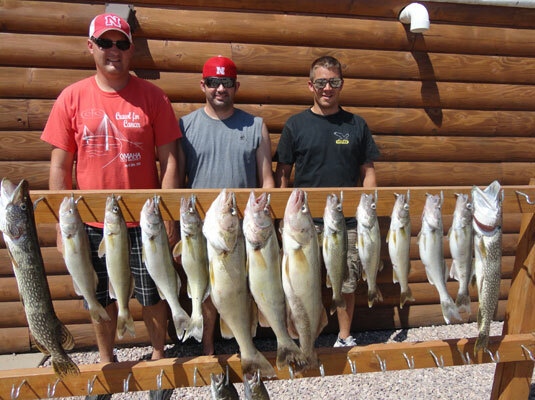 As the picture shows these guys had a great trip getting a lot of big fish along with limits of eating size walleye. Many of the guides fished deeper as I myself did catching many of the bigger walleye down as deep as 50 foot. As the water drops many of the fish are chasing suspended or deep bait fish so going after them way down there is sometimes necessary. We fished Spinner/crawler rigs on 3 oz. bttm/bouncer for most of the bigger fish but caught fish in 25 to 30 fow on humps with just plain hooks and crawlers. With 20 guides out just about every kind of presentation from trolling plugs, jigging, and bouncer fishing was working from depth of 15 fow to 60 fow so this report is probably not going to narrow down a pat way but should indicate fishing all ways can work along with minnows, crawlers, leeches and plugs as bait. The big key for me is to find the bait fish and get some lines in them and just about all the time there will be some fish around. I would sure like to thank CVA for showing their appreciation to a great bunch of guys every year and they sure make the Outpost Lodge and a whole bunch of guides very happy. Great company and just a great trip annually for everyone involved. I am looking forward to the the second bunch of 75 guys Thursday and Friday and hope we can keep them all catching and eating fish, ribs and steak. The weather has been absolutely beautiful for the last three days with fall like weather (record 41 degree low on the 17th) and the fishing remains about the same as the last report. Plenty of smaller walleye for some action but it is considerably harder to come by numbers of big fish. 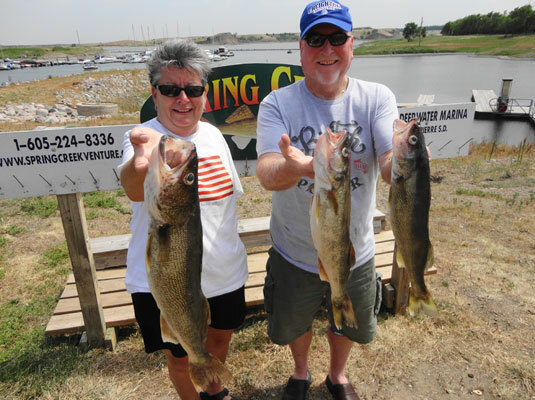 I fished Doctor Doug and Anne Long and Doctors Gary and Liz Moore from Omaha along with Larry Porter to limits of walleye for Spring Creek Marina. Then took out repeat customer Eddie Heeb and his boy from Midland out for a day of fishing catching their limits of walleye along with a few northern, smallmouth and catfish. I am now helping Dave Spaid guide the whole crew of Capital motors of Pierre and Gillette Wy. Got three of them there limits along with one walleye a nice over 27 incher that they are getting mounted. We caught all of these fish in around 30 fow on nightcrawler's using either spinner's or plain hooks on bottom bouncers. 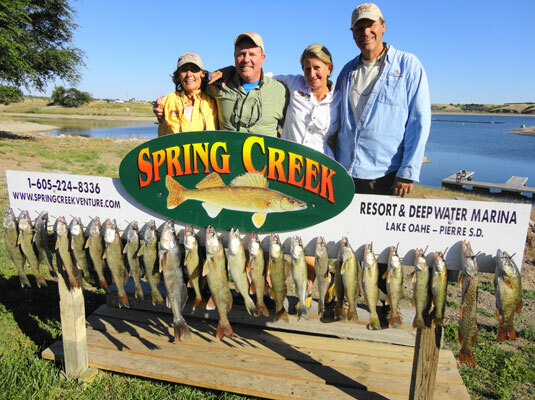 We caught some way in the back of creeks or just going out of the spring creek/cow creek ramps and fishing the main lake. Although I haven't been down on Sharpe for a while many of the other guides I work with have and for the most part are reporting that the bigger fish are harder to get but action should get better as falling fall temps bring the fish and bait up river and out of the weeds. I heard about another lower unit that found a rock going out of the boat ramp at Little Bend (low water ramp) so with the fall water drop on the lake be careful as it is very easy to assume safe passage from a couple of weeks ago and end up with a not too happy trip. Fishing for the big ones on Oahe continues to be tougher than it has been. 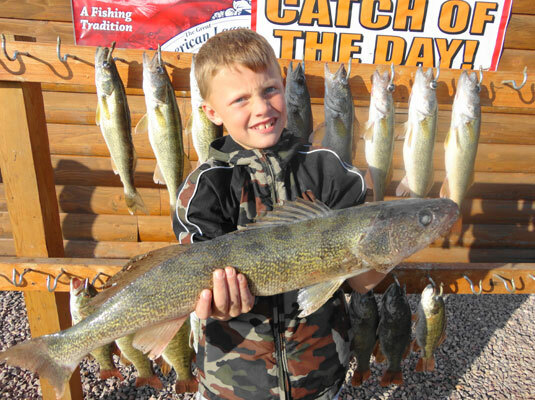 There are still plenty of walleye being caught but the avg size limits being brought in are over all smaller with numerous 14 inch fish being mixed in with the nicer fish. The same seems to hold true for the West Bend area of Sharpe. I fished a real nice bunch of guys the Jay Woofer group from Kansas for the last three days catching all of there possession limits of walleye some bass and northern pike and catfish. They had plenty of action but the overall size of the fish we kept were a smaller size with around a 15 to 16 inch avg. 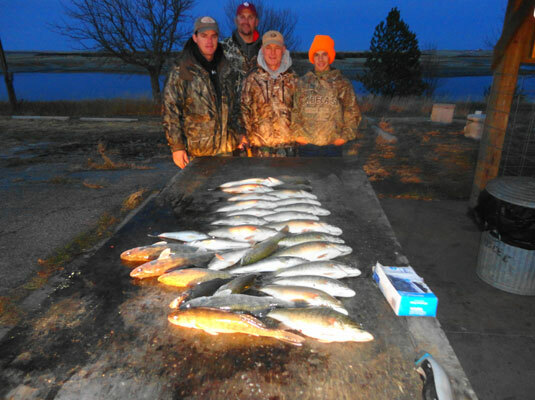 We also caught a lot of fish down as deep as 45 fow on Oahe using mostly night crawlers/bouncer rigs with a plain hook. Lots of ways still working (plug fishing, jig fishing and even jigging spoons) so if you have a preference it should work. The water is still dropping so Sharpe should continue to improve around Pierre but right now I would call Sharpe spotty around Pierre with those landing on areas shad are using doing well. Both spinner/crawler rigs and minnow rigs are good choice's in around 10 fow. Pulling plugs such as flicker shads can be very good but many areas have floating weeds making this difficult at times. I guided Jeff Dewey and friend from down around Firth NE to there limits of walleye with a real nice over 20 inch fish along with 3 northern pike to maybe 12 to 14 lbs. I stayed spinner/bouncer/nightcrawler fishing in around 30 fow. It was a real nice day and we caught and released many smaller walleye but recently I have had a lot harder time getting 18 to 19 inch fish in the boat and the over 20 inch fish aren't as numerous as they have been. I think part of the reason is the fact that the corps has been dropping the lake considerably so many of the fish and bait are moving deeper and in many cases suspending. This makes them a lot harder to find and probably might be a reason to start thinking about lead core line/inline weights and trolling plugs deeper especially for the big fish. The plus side of the lake dropping is the fact that the corps is releasing a lot of water below the dam making the fall movement of walleye in Sharpe better. I talked with some of the other guides that fished on Sharpe the last three days and they did very well limiting with nice 17 inch average fish and some over's so if the bite on Oahe stays harder for the bigger fish I will probably start fishing Sharpe in the Pierre area more. If the bite there gets even half as good as it was last year it well be way above average fishing. Oahe is still very good fishing and you can expect to catch limits but probably most anglers are going to have to work harder to come in with the real quality bags. It is not all bad to go out and catch eating size limits and just about everyone that knows the lake is doing that. Remember that dropping water grows big boulders in spots they weren't last week. Three lower units over the last 30 years makes me well qualified to offer that advice. 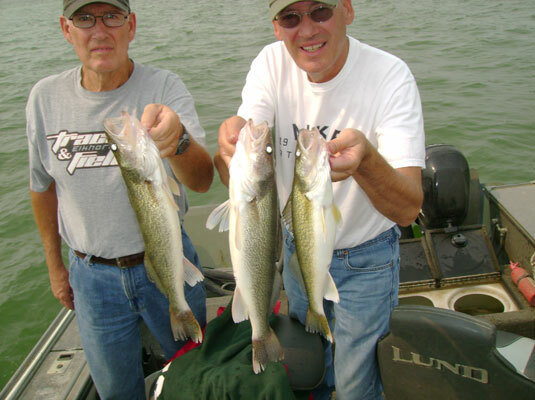 The walleye fishing around the Pierre area is still good with some nice northern pike and smallmouth bass serving as bonus fish in most angler's catch's. 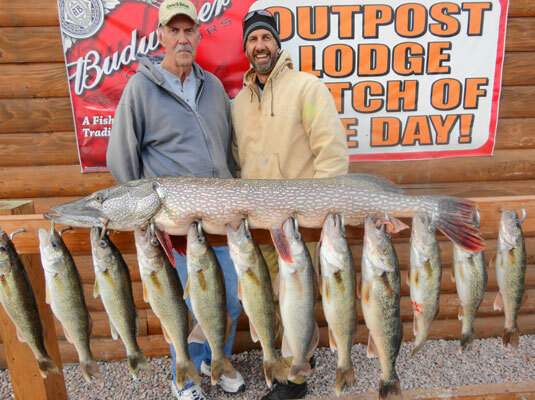 Limit's are still the norm especially for those anglers that know the Lake. I guided Bob Patrick from the Atlanta GA. area and his daughter Rachel along with her friend from the Rapid City area to some nice fishing, catching limits of walleye, some northern and a few bass. I then took out the Chris Weigal group from Omaha and we caught their possession limit of 24 walleye a few northern and bass to take back to Omaha. I stayed fishing with bottom bouncer spinner rigs or bouncer plain hook/crawlers and fished mostly in around 30 fow but we did catch some of the bigger fish as deep as 45 fow. The best blade's for me when guiding this summer have been Chartreuse and yellow daredevil blades with a silver back in both size 3 and 4 Colorado's (perch colors) or hammered Gold. In most case's if I am fishing in 20 fow or less I favor around a 1 1/2 oz. bouncer but go to a 3 oz one when in 25 fow or more as I like to troll at least 1 mph and it take's the bigger weight to allow that and stay close to the bottom in the deeper water especially in wind. A 2 oz bouncer would be a good all around choice for most spinner fishing. Normally I spend more time fishing with plain hook/bait rigs but this summer because of the amount of fish we have been catching and releasing spinner fishing seems to have fewer small fish swallowing the hook. The same advantage would apply to both jig fishing and trolling plugs. The boat traffic has thinned down some and a lot fewer boat trailers at the ramps along with fewer anglers out during the week days. I did hear that GF&P's opened the low water ramp at Little Bend so access there should be better. I haven't been down on Sharpe recently but reports from some of the other guides indicate that on many days it can be harder to put numbers in the boat right now. That should change as fall approach's and more fish come up river or out of the weed's. Not much on the Salmon fishing and for the most part that has just been a hard fish all summer. Normally I think of August as stable but hot weather but we just got a couple of real windy days blowing in with gusts of 50 mph and sustained winds of 20 to 30 mph. Friday and Sat making the family I guided really work for their fish. I guided the Bob and Susan Snyder family along with two of their boys on Oahe to possession limits of walleye, some Northern pike and some smallmouth bass. A really nice family from the Omaha area. In spite of the wind ( A family of real troopers) we caught all there fish with 2 fish over 23 inches and another 20 incher along with 32 eaters and throwing back many smaller fish. They enjoyed fish for supper with a nice batch to take home. 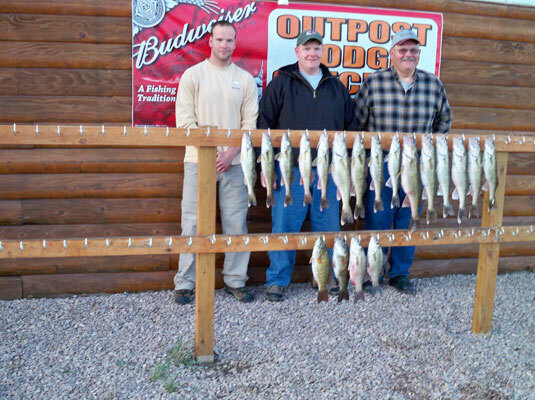 We caught all of these fish from the Spring/Cow Creek area of Oahe fishing in around 28 to 30 fow with both spinner/crawler/gulp rigs to spinner/plain hook/crawler rigs with bottom bouncers (3 oz's in the wind) The bite on Lake Oahe remains excellent with most boats limiting out but maybe not being as selective as summer winds down. There are still plenty of big fish over 20 inches being caught but it is harder to put the 18 to 19 inch fish in the boat. Lake Sharpe is good but can be spotty with days when the corps run's the current either too fast or too slow. There is also a lot of bait right around the Pierre area so they have plenty to eat. I was surprised the last time I fished on Sharpe catching some real quality walleye with several over 20 inch fish. We did not get numbers however. The Salmon bite is still poor but I do hear of an occasional 2 to 3 fish catch coming in. For the most part Salmon fishing is still very hard fishing. The bite is numbers for walleye all the way up the system with all ways working to catch the fish but you have to go threw lot's of smaller fish to get quality stringers. I guided Bob and Bev Arkseld from Defiance Iowa for the Outpost Lodge and then I took the Tom Craig family from the Vermillion area fishing. 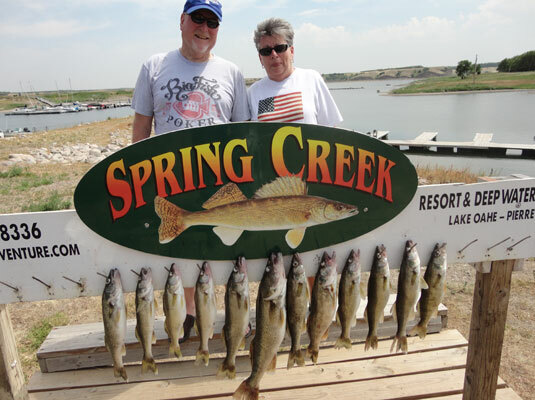 I spent the day on Oahe with Bob and Bev catching their limit of walleye's with one to 22 inches that Bev caught and had a real nice time with them .I then took the Craig's down on Sharpe for a day and then on Oahe for a day. The fish we caught on Oahe were mostly in around 30 fow and we caught them with night crawlers on spinners or a plain hook/bottom bouncer rigs. The fish we caught on Sharpe were in around 10 fow and we caught them on spinner/crawler rigs. I was surprised at the size of the fish on Sharpe as the first two fish the Craig boys caught were over 20 inch's and we kept and easy 18 inch avg. limit for the parents. We caught 25 walleye or so by noon on there last day keeping 19 and with 100 degree heat they elected to call it an early day so we in bounded for the ramp and the cleaning station. The bite has got a little harder for nicer slot fish but depending on the area's you fish it can still be excellent even for the big fish and keeping limits of smaller fish is still easy to do most days. With the weather getting toasty some day's you might have it in your plan's to get on the Lake early and come in before the hottest part of the day. Some northern pike and some small mouth bass are still a part of daily catch's of most anglers on Oahe as well as limits of the walleye A lot of night fishing has been going on around the dam area and on the big flats (primarily plug/trollers) but be careful as everything is harder to do at night and it is a lot easer to get a hook stuck in you or get into trouble with other boats that have poor lights Be prepared to be in the middle of a lot of boat traffic at time's .Gary Roach told me on a trip I made with him in NE. in the 70's if I didn't know there were better things to do at night it might be better if we didn't hang out together and I believed him and feel like I can catch plenty of fish in the day time including big ones. I acknowledge the fact that it is the only time some anglers can get on the lake because of work so night fishing has it's place and any one can catch the bigger fish as they are less leery and darkness hides the boat If just targeting bigger fish and maybe cooler temps are your bag go for it. It is easy catching fish but be watchful as all the dangers that are present when you are fishing in the day time are compounded at night. The lake has been dropping so keep your eyes on your depth finders as new hazards are popping up daily. Maybe being a little to preachy but I know of to lower units that got knocked off this last week. I finished guiding Gary Loseke and Jared Sprunk from down around Platte Center and Monroe NE and then guided retired schoolteacher Jerry from Iowa and grandson Mike from Pierre. 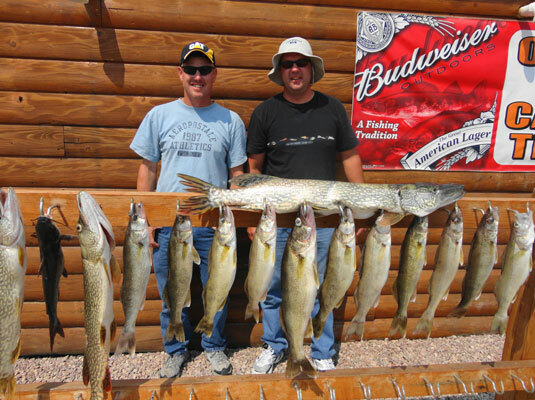 to possession limits and limits of walleye with a few northern and a few bass. Fished both these party's primarily way in the back of creeks or on the flats. There are hatches of some kind of bait going on in many of the feeder creeks right now and were ever you find these there will be walleye. We pulled spinner night crawler or spinner gulp on bottom bouncers mostly in around 12 to 17 fow in the creeks but fished deeper (28 to 35 fow) when on the main lake flats. It is harder to come up with the 18 inch and up fish than it has been. I think the reason might be many are chasing suspended bait on the main lake and maybe down deep. (45 to 50 fow) Also as I mentioned many are finding the hatches in back of the creeks making running them down a little harder. Although I haven't been down on Sharpe those fishing there are doing well and 17 inch limits of fish or better are not uncommon. All ways are working this summer so if you are a plug fisherman a lindy or Jig angler or whatever you can probably come home with limits of walleye but the avg. size limit seems to be getting smaller on the under 20 inch fish with more people keeping the 14 inch fish know. If you are going to use the little bend boat ramp be careful. GF&P has closed the right side and the left side has 2 fow. Foster bay in the back of the Cheyenne is closed due to dropping water so if you are planning on using some of the out of the way ramps better check the boat ramp reports on GF&P site. 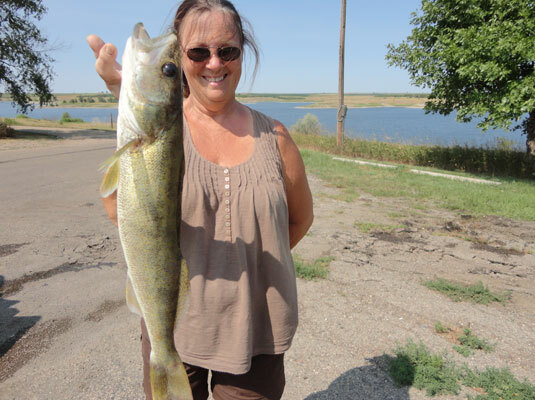 The bigger fish on Oahe are getting harder to come by but getting a walleye to mount is still a realistic possibility as several of my recent customers have found out. I fished the Dan Pletcher group from KS. to one fish they are getting mounted 28 incher along with another 26 incher and a couple of other over's. The rest of the catch (possession limits) were a smaller avg. size then I have been getting with fewer 18 to 19 inch fish bringing there over all avg down. Then helped Dave Spaid guide a group of MN seed company fellows to there limits and I am now guiding repeat customer Gary Loske and his friend. Fishing on Oahe remains very good and with Loske we only kept 17 inch or better walleye getting a nice big one in there stringer to go along with limits of 18 inch avg. size fish. I have been fishing mostly with spinner/crawler rigs or spinner gulp worm rigs on bttm bouncers. Caught most of the fish around 28 feet of water on the flats for the first 3 days but went shallow to 20 fow or less today and did better on 17 to 18 inchers. All ways are working however to catch the fish from pulling plugs/ casting jigs /jigging spoons etc. There have been a lot of tournaments on the week ends creating big time boat traffic and very busy boat ramps so be prepared to see other boats. Maybe as August starts this traffic will diminish but the bite is good so you will fish with other anglers if you are going to fish the big flats or the more popular spots. Sharpe has less traffic and a 17 inch avg. stringer for those who know the river is common in the Pierre area .Salmon bite has been poor all year and remains so with very few nice catches turning up. I have been seeing huge hatch's of bait recently in the back of creeks and although I am not sure what most of it is it sure looks encouraging. The weather has been hot but breezes on the lake make fishing bearable but getting out early in the morning and coming in a little earlier in the afternoon is not a bad plan on some day's. It is getting tougher to come up with consistent limits of over 20 inch fish on Oahe but the numbers for limits of 15 to 17 inch fish are still there. I guided the Eric Wilson group from KC area, then the Dave Lazenby group and then Leonard and Jane Tenrus family from Omaha to possession limits of walleye, some northern and some smallmouth. We caught plenty of fish on all these trips but it was harder to come by the bigger fish however we did have some over's. We caught most of these fish in around 25 to 30 fow pulling spinner crawler rigs and either Berkeley gulp worms or night crawlers. The weather has been nice but very hot with temps over 100 degrees daily encouraging early come in times to beat the heat. Lake Sharpe is putting out limits due to the fact there is no minimum size limit until September and Salmon fishing continues to be poor. Congratulations to both John Campbell and his former partner Ted for winning back to back tournaments on Oahe. These two go way back on the tournament trail and earned the wins. I think they found a tree full of big ones and they sure know how to catch them. I guided repeat customers Allen and Ellen Buckley from Omaha Ne. 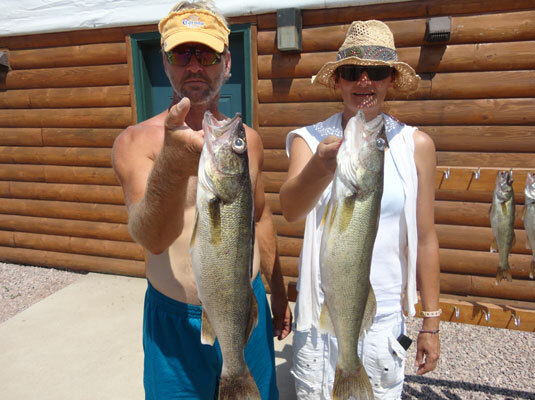 to their possession limits of walleye with Ellen catching one around 27 inches and getting another big fish around the same lost at the net along with Allen catching and releasing a big northern (flopped out of the net) around 18 lbs. 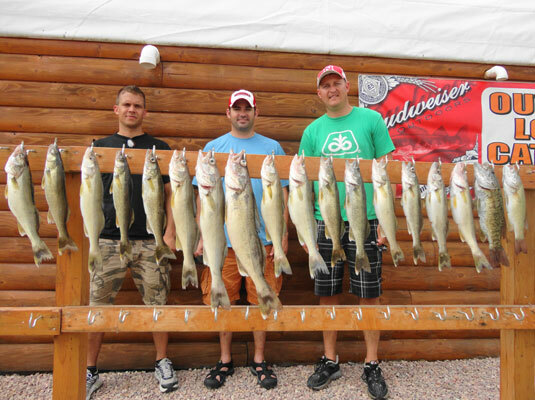 They also got a few more over 20 inch walleye keeping a nice 18 inch avg. size fish for them to take home In spite of very warm weather (100 degrees plus) they had a great time. 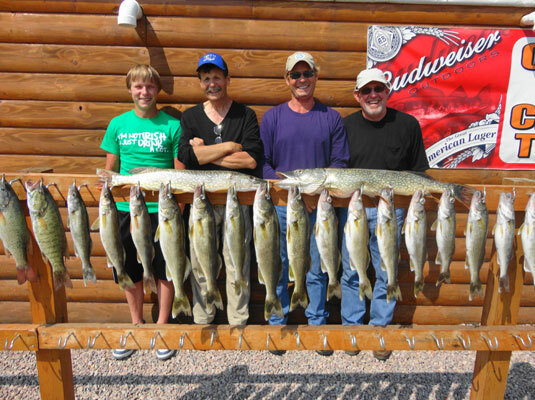 Once again we caught and released numerous walleye to get this avg. We caught all these fish pulling spinner/crawler/gulp worms rigs running along the drop off's on points or flats on the lower end of Oahe. Twenty fow to thirty fow seemed best. All ways are working though and you can catch the walleye just about any way you like to fish for them. Minnows, leech's and plugs all working. We beat the heat by getting off the water before the hottest part of the day and both days had the fish cleaned by 3 o'clock. A smart thing to do when the bite is so good. Everyone tells you to drink a lot of water to stay hydrated and that is true but I was getting cramps at night and mentioned that to a Doctor client of mine last month and he told me to start drinking a lot of gator aid/sports drink product's so I bought some. Nothing beats water but to beat cramps sports drinks seem to work. I mentioned in my last report that GFP says we have a lot of lake herring as bait in Oahe and since then I have found out from GFP's commissioner John Cooper that they are fall spawner's so that might create some interesting places to look around for the fish when they are spawning this fall. Salmon fishing is poor. Sharpe also good for numbers and limits. I will start with some news from GFP's recent press release. 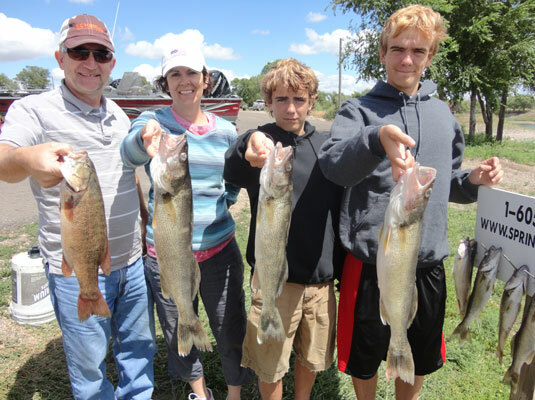 Walleye catch rates on both Oahe and on Sharpe are at record highs this year and they are saying that for at least the next year or two there should be a lot of walleye. 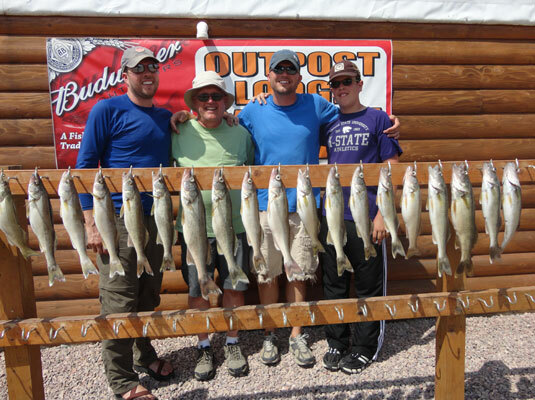 Their summer accousting sounding surveys indicate significant numbers of bait fish and believe that Lake Herring had a big hatch in Oahe offsetting a poor smelt run this spring along with smelt going through the tubes last year. Positive news and maybe a clue to look into the habits of lake herring as a key to catching bigger walleye. I think they are usually deeper and suspend so it could be the reason I am hearing about walleye being caught all the way down to 70 to 80 fow around the tubes at the face of the dam. 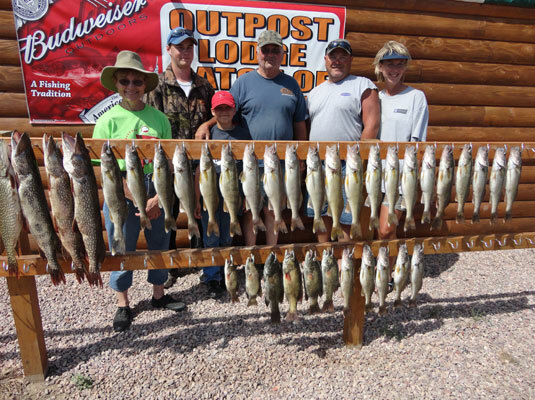 (Some by Salmon fishermen on downriggers) I guided in big wind for the outpost lodge on Saturday and Sunday and did 20 fish limits but kept a lot of smaller fish due to the big winds (gust to 35 mph) and 109 degree heat. Then went out with Tim and Susan Miller repeat customers from down Omaha way. I had a great time with these two and was glad to see them get a real quality stringer with low wind but high temps we quit at around 1 o'clock with a 12 fish limit of both their over's (A 21 INCHER AND A 23 INCHER) along with some 18 and 19 inch fish. Probably caught around 30 to 40 fish to do that but when the last limit fish a 19 incher hit the boat and the thermometer hit around 104 with very little breeze we in bounded to air conditioned rooms. We caught these fish pulling spinner/crawler rigs staying from 20 fow to 30 fow mostly along tree lines on the flats. You can catch the walleye just about any way you want right now and minnows, leeches, plug fishing and Gulp worms on bouncers or jigs are all working. The fish we caught were all very healthy and I am seeing far less stressed fish were I am guiding but once again the walleye seem to be on the bite most of the time. This could be due to the huge numbers of 2 to 3 year class fish in the lake along with less bait or both. I am not sure about the reason for the mega bite but I think just about every one that is fishing Oahe this year is liking the way things are. Great fishing for everyone. I guided the Robby Simard/Palfinger group from around the Omaha area to possession limits of walleye, some northern and a few bass. These guys had some really nice fish with two over 26 inches and a pair of 24 inchers along with at least a 17 inch avg on the rest. They counted the number of walleye they caught and released (I didn't put them up to that) and they had in the neighborhood of 200 released to get this avg. We caught all these fish on either spinner/bouncer rigs or bouncer/plain hook rigs in around 20 fow with crawlers or leeches the main bait. 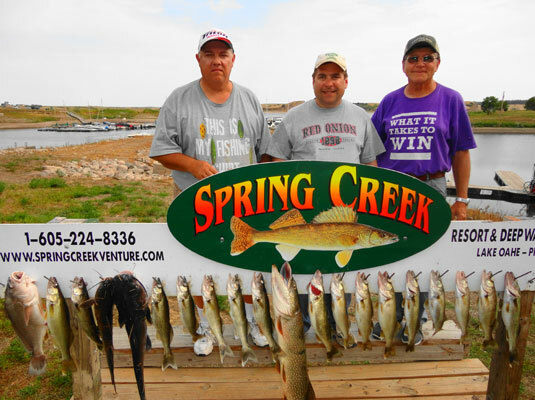 There is a great bite in the trees on all the flats but it can be crowded there so we never fished any trees for these fish and just avoided areas that had a lot of boat traffic fishing mostly from around the dam to the Deep Creek area of Oahe. 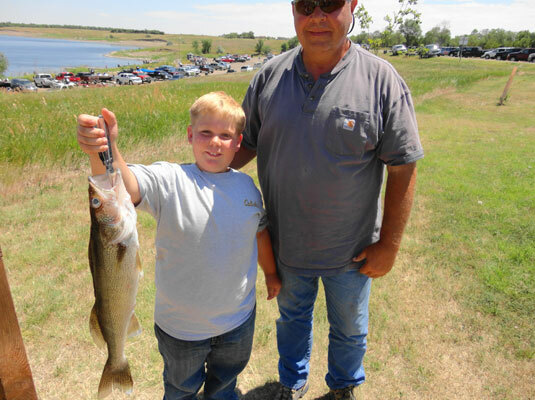 Lake Sharpe is still on the no size limit other than one over 20 inches each so those fishing are getting plenty of fish to take home but for size and numbers Oahe remains the best choice to fish in the Pierre area. Probably know a little more about the salmon bite this week as I have friends fishing for them but it is spotty with both walleye and salmon being caught down around 70 fow in the dam area. 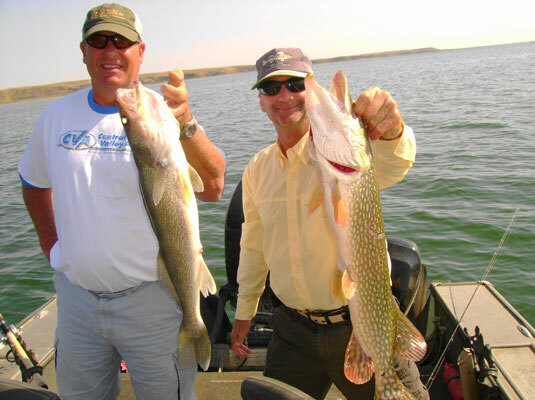 Fishing on both Oahe and Sharpe still going strong for walleye along with northern pike and smallmouth bass on Oahe. 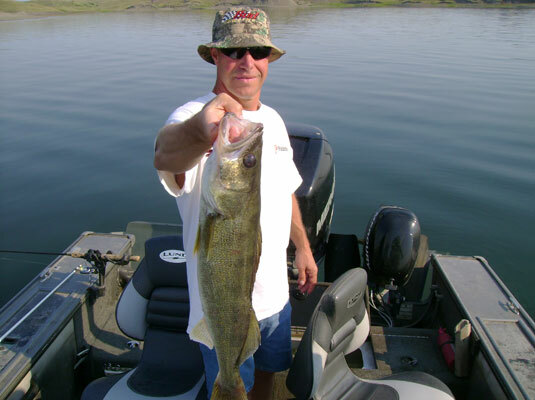 The fish are being caught on Oahe just about every way you can catch walleye from bttm/bouncer crawler/spinner fishing, plug fishing with fire line and lead core line, jig fishing and casting jigs. Leech's, crawlers, minnow's are all the live bait choices. You can catch fish pulling plugs or spinner's shallow in 10 fow or go out to 30 fow and get them there. I am not sure what depth is the best for the over 20 inch fish as we have caught them both shallow and deep but might give the edge to leeches or minnows in 30 to 35 fow. 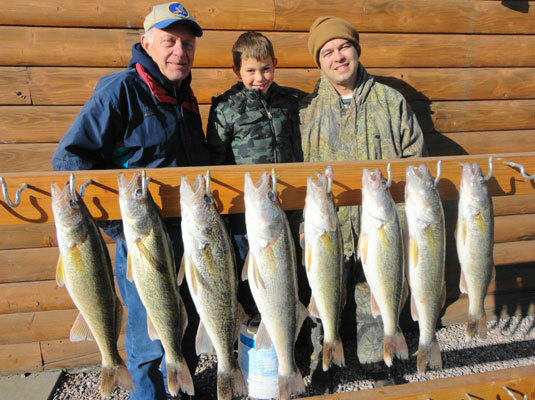 I fished repeat customer's Max and Tom Nordeen and grandson/son Jace to possession limits of walleye with all there over's and plenty to eat every night along with some northern and smallmouth bass. Caught around 50 to 75 fish a day being selective and keeping a 17 inch avg. size to take home. Just as good a family outing as I have and we had a great time. 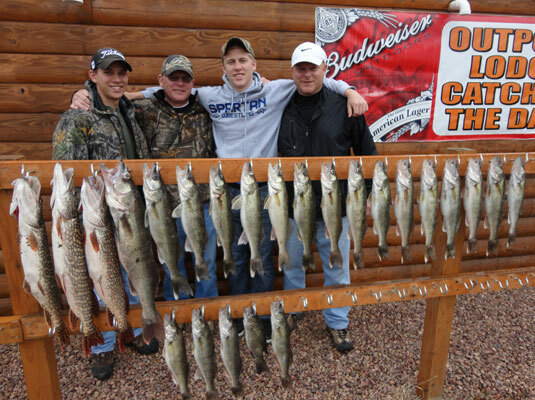 I then fished the Swartz guys from down Kansas way to possession limits of walleye with their over's and some for lunch. Weather was great for both of these trips with nice breeze's and 80 degree days so until you hit land you feel it isn't real hot. Most of the fish I have been catching in the Pierre area seem healthy and I actually have been seeing more ball's of bait around but the fact that the fish just seem to bite all the time indicates hungry fish so I still am apprehensive about our bait situation. Plenty of boats around and I think the harvest this year must be on a record setting pace. Fished John Thomson and son to possession limits of walleye some northern and a few smallmouth and then fished Bill Stegman and son Nick to there possession limits catching maybe 50 fish a day or more with both groups and getting some real nice over 20 inch walleye and some real big northern. Caught most of these fish on bttm/bouncer crawlers or leeches but all ways work from trolling plugs to jig fishing or spinner fishing. Fish are every where from 10 fow to 45 fow. All the big flats are going with plenty of fish in the tree's if you want to work them out. We caught most of these fish in around 30 fow. I am fishing mostly from the Spring/Cow creek areas to the Cheyenne river and fishing is just great all the way up and down the river. The Sharpe 15 inch limit is off right now so those fishing there are getting plenty of fish to take home also. Salmon fishing is slow with most of the fish that are being caught down around 70 fow. Had a good time with both the party's above and it is always good to see guys taking there kids or grand kids on these kinds of outings. Fishing is a great family sport. Watch your depth finder's for shallow spots if you haven't been on either Lake this year as there are plenty of hazardous spots. 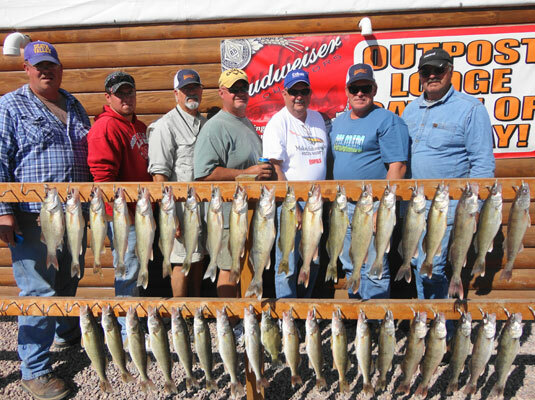 I along with Dave Spaid, Scott Van Lyre and Larry Porter guided the Paul Jacobsen group of 12 to three great day's of fishing sending them home to the Omaha area with possession limits of 96 walleye to eight lbs. and lots of northern pike and smallmouth bass. Jeff Gamm and father in law Bill Mcvey along with there sons and grandsons Chris and John, Paul Jacobsen and sons Alex, Nick, and Cory,and Joe Moylan and Sons Matt and Clint all from the Elkhorn Valley, Omaha area just plain caught at least 50 to 60 walleye a day releasing all the smaller fish and keeping at least a 17 inch avg size walleye with two 28 inchers (mounting one) along with possession limits of all there over 20 inch fish. 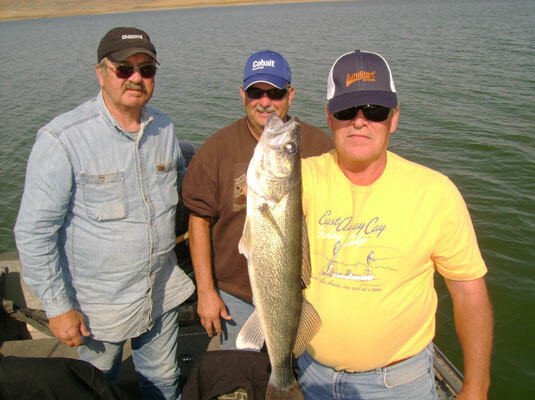 They are all repeat customers of mine and have had many great fishing trips to Oahe over the years but they all thought that this one was if not the best one it was in the top 3. Just as great a family group as I have and all of us guides really enjoyed fishing with them. Great weather and just super fishing. 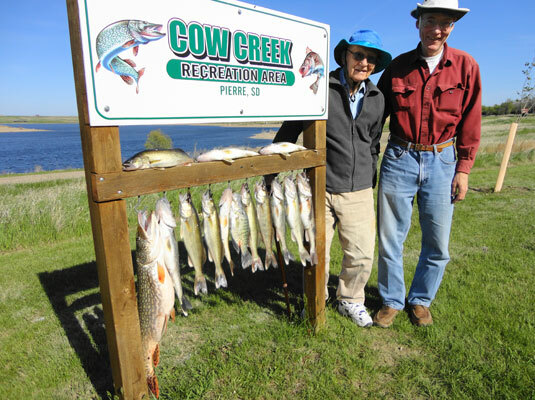 We guided this group from the Cow Creek area of Oahe to the Cheyenne river area catching fish on spinner/crawler rigs in 12 fow to leeches/minnows on bottom bouncer rigs out to 35 fow It seemed like we caught more of the over fish in deeper water but caught most of the northern pike in shallower water. 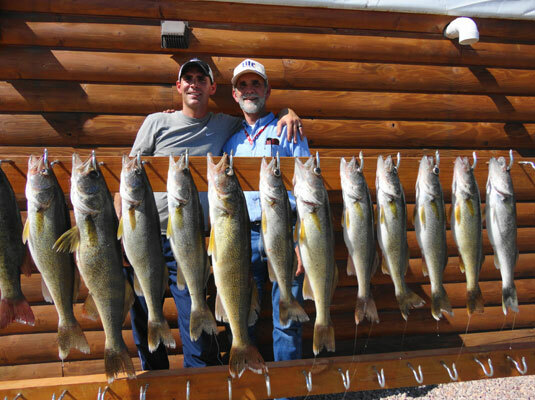 The fish are just all over and the harvest of walleye on Oahe is going at what may end up being almost a record harvest. This is probably very good as big spawns coupled with loss of bait with the record releases last year favor a reduction of the number of mouths in the lake. 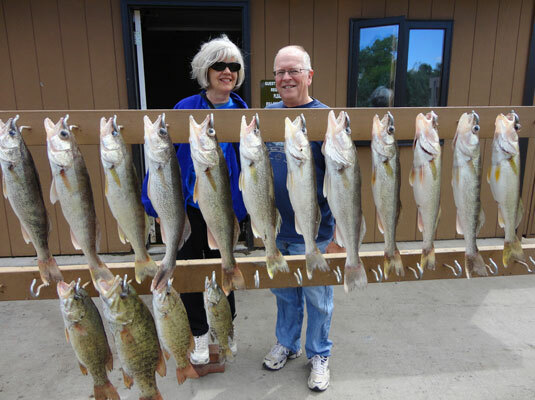 The Lake is very busy so expect to see boat ramps with plenty of trailer's Sharpe is still going strong and you are able to keep walleye under 15 inches there so those fishing Sharpe are having little trouble getting their fish. Salmon fishing is still spotty. Have a great 4th of July. I attended a GFP informal meeting at the request of John Lott the current head and along with John Cooper former head, state wildlife biologist's, Guides from Mobrodge area the 212 bridge area and the Pierre area and some local area fisherman. It was a round table discussion of Lake's Oahe/ Sharpe and the current condition of the fishery's. The following were some high point's that I took away from the meeting. Number one is the fact that due to the previous high water we have had record spawns and the lake is just full of 2 to 3 year class fish. This coupled with record releases last year depleting the smelt/ bait numbers has caused concerns among all present at this meeting. Most of us guides and fishermen have never seen the amount of fish in the lake and also the amount of people catching limits every day. Due to this fact and GFP records that indicate there have been more fish harvested this year than there were when GFP increased to a 14 fish limit in 2001. This lead to the conclusion by many at the meeting that it is not yet time to increase limits. Also GFP have not conducted all of there annual bait surveys and are going to do most of this in the next two month's Number two I along with every guide agree that there are many walleye and other fish showing signs of. stress however there are just as many that appear to be healthy so I think more of a wait and see altitude developed and depending on the next bait surveys recommendations as to limits increases if any will be decided on later this summer or fall .Personally I thought that higher limits to reduce number's would be good but then I hadn't taken into account the record harvest by fishermen this year so for now remain hopeful that things will work out. Everyone is hoping for a big smelt run next spring along with a mild winter to enhance shad survival. I will comment more on the situation in the next reports as there were many other things mentioned. One thing I took away from this meeting was the fact that GF&P's personal are well aware of what is going on and I think they are as concerned as any of us and are working hard to stop any problems with the fishery. The scary part for me is how much Mother Nature plays in all of this but it is good to know we have GFP personnel committed to keeping the balance of fish/bait as healthy as possible. 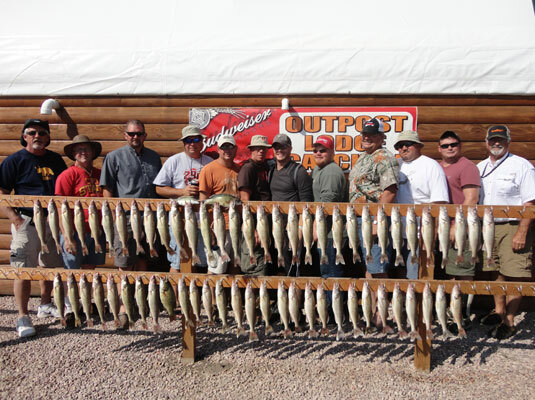 I along with a lot of other guides helped the Outpost Lodge fish the BPI group to a great time with all boats catching limits of fish for this company. The bite is really great for numbers of fish but you have to throw back many to get up to a nice avg. size limit. Most of the fish were caught in around 20 fow but going out to 30 fow or even going shallow sometimes works as there seem to be fish all over. Every thing from pulling plugs to live bait fishing is working with crawlers, minnows, leeches, and artificial baits such as Gulp the main choices. My boat had walleye limits every day with some over's one around 28 inches caught by Kenny from Iowa .I am starting to think Gulp worms, minnows or leeches or spinner or jig fishing might be the best presentation's right now just to avoid cutting so many hooks due to swallowed baits. 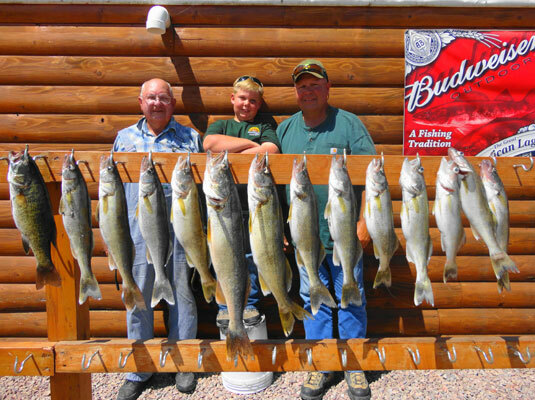 There are record harvest's of walleye going on all up and down Oahe and just about everyone with any experience catching limits. The fish are starting to show up on all of the big flats but you can still get some nice ones half way back in creeks to. I would like to thank the BPI company for coming every year as they make me, The Outpost Lodge and a whole bunch of other guides along with all there employee's very happy. I guided Carl Herreman and his friend Craig Farrell from the Omaha area to possession limits of walleye and smallmouth bass keeping around a 17 inch average size fish along with some bigger walleye to 24 inches. We probably caught around 50 fish a day or more to end up with that average. 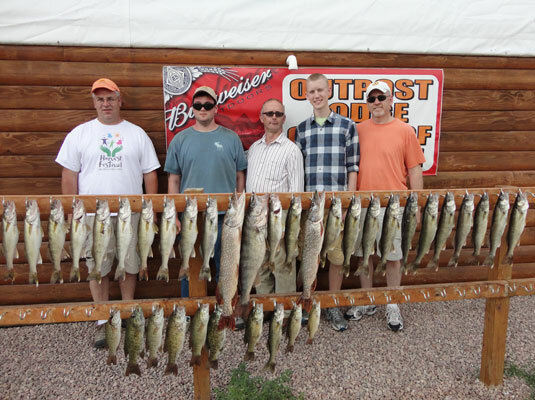 I then worked for the Outpost Lodge guiding a group of 5 for two days and catching their possession limits of walleye some bass and some northern pike. The bite is still very good on Oahe and we caught all of these fish using bttm bouncer/ minnows, crawlers or leeches and gulp worms in any where from 10 fow out to 35 fow. Some times some of the better fish have been deeper so you have to look around if you are just catching a lot of smaller fish. 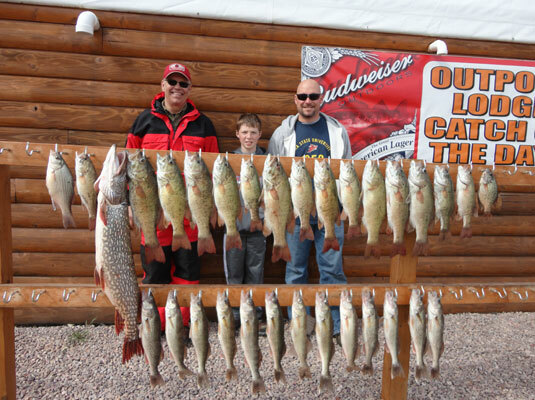 We put spinners/crawlers down in around 10 fow and worked the bays catching big northern and some bigger walleye. There is a lot of boat traffic around as the lake is very busy so I try to look for areas that haven't been fished and I think that is one of the keys to producing a little better average size catch. It pays to keep moving further out from the main boat ramps until you run out of other boats weather permiting. Lake Sharpe is still good from Pierre down to West Bend but you have to work through numbers of fish there also to get good keepers. I haven't heard much about the Salmon fishing but think it is still slow with not many numbers around. 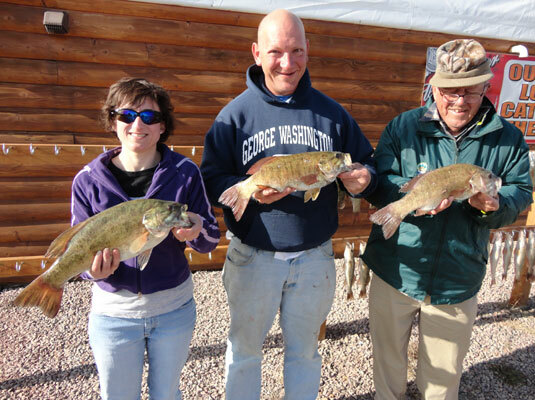 The fishing on Lake Sharpe has slowed for the nicer big fish but continues to put out numbers of smaller fish along with smallmouth from the Pierre area to the dam at Fort Thomson. 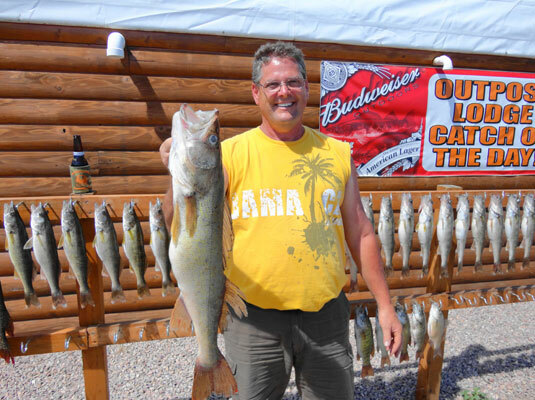 Lake Oahe fishing is still going strong around the Dam all the way up river.You still have to catch and release numbers of smaller walleye to come up with a nice average size limit. Catching a lot of numbers is great fun for most anglers so I think we are having a lot of satisfied anglers as most boats coming in with limits of walleye, some northern and some smallmouth bass. I fished Gordy Sorensen and his Roberts Pump and Supply party of 12 to three days of great fishing with one day of big wind but still catching a lot of fish. We had almost all of there possession limits of walleye with around an 17 inch average and most of there over fish to 25 inches the first two days along with some real nice northern so we spent day three getting limits of smallmouth and northern along with a lot of throw back walleyes. They took there limits of 96 walleye, around a 100 smallmouth bass and around 15 northern home along with eating a bunch of walleye appetizer's every night. They will enjoy some great eating back in Cario NE. We caught most of the walleye in around 10 to 17 fow on bottom bounce/crawler rigs and caught the smallmouth pitching gulp pumpkinseed minnows into the tips of rock points/shoreline's. The bite on Oahe is good with just about any way you want to fish working. Leech's, minnows, crawlers, and pulling plugs are all catching fish. 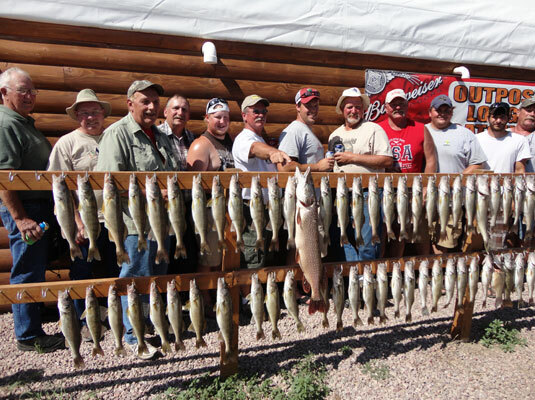 All of the fish were caught in the Cow Creek to Cheyenne river area on Lake Oahe. This was just a great bunch of guys and all three of us guides really enjoyed taking them fishing. The Salmon fishing continues to be spotty but I did hear of a few good catches by the dam. For the most part very few boats are coming in with numbers of salmon. If you are making a trip here for the first time this year I will say once again watch your depth finders as there are plenty of hazards just under the water because of the lower water levels from last year. We watched one boat go out of the Little Bend boat ramp and run full blast into a big rock island bending his shaft. Just one example of the many spots that are around and it is real easy to get in a hurry and get in trouble. I had a question about the health of the fish. Most of all the fish we are catching in my area of Oahe seem healthy enough but every once in a while we will catch one that looks stressed and skinny and I have heard of other guides catching bigger fish that are skinny so there is certainly some concern about a lack of bait along with the huge numbers of fish in the lake. I am going to a informal meeting next week with some GFP's personnel along with other guides and some fishermen and will try to pass along any info that I can after the meeting. The fishing on Oahe continues to be as good as it gets. Just about every boat out in the Pierre area (dam to bush's landing) coming in with limits of walleye plenty of northern pike and smallmouth bass. The size sometimes is smaller for those boats not wanting to release the nice eating size walleye (14 to 15 inch fish) and you have to throw a lot of fish that size back to build a bigger overall avg stringer if that is what you want to keep. 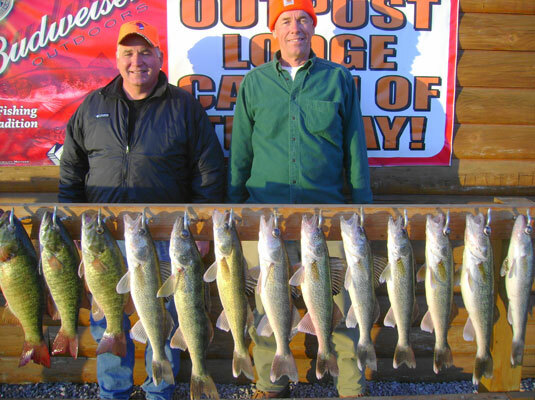 I guided repeat customers, Dave, Rex, Tim, Jim and Mike Reezac to two great days of limits of walleye's averaging well over 18 inch's catching and releasing at least 75 fish daily to do this. Mike had the largest a 28 incher but all the brothers caught big fish and we had a great time also catching a few big northern and some smallmouth. I then took out repeat customers Randy and Randy Downing from Sioux Falls and Rapid City, SD to great limits of all there over's and around a nice 18 inch avg on the rest of the limits doing the same just keeping 17 inch fish or better. Dad Randy caught the biggest of the bunch a nice 24 incher. 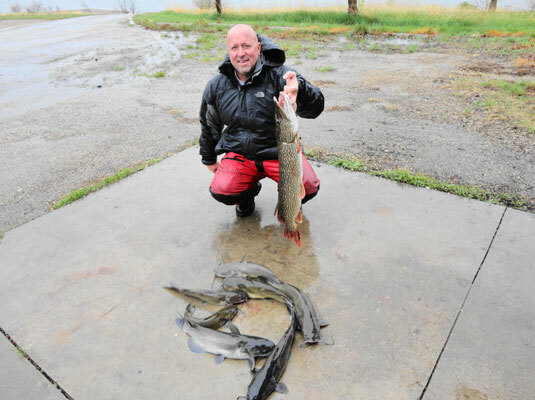 All these fish were caught in 10 fow to 20 fow on bttm/bouncer crawler bttm bouncer gulp worms and some on leeches fishing out of the cow creek /spring creek area on Oahe. I finished guiding the Dana and Lori VanDyke group from Kearney NE To possession limits of walleye some northern and smallmouth bass to take home. Just a great bunch and we had a great time. I then went on to fish KC customers of Spring Creek Marina Lon and Guy to three days of limits of walleye, smallmouth bass and around 10 northern pike. Lon caught and released a nice 28 inch walleye and the rest of there limit was around 17 to 18 inch fish with some more over 20 inch fish. Then guided Kevin and Sandy Orberg to nice limits of walleye keeping 17 inch fish or better with them catching both of there over fish and releasing a nice 28 incher I encourage taking cameras along and picturing these bigger fish as they take probably 10 years to get to get to this size and you are giving another angler a chance to get lucky. Both Lon and Kevin got nice pictures and both of them felt just great watching those big fish swim back into the deep. All of the above fish were caught fishing out of the spring/cow creek area using bttmbouncer/crawlers or Berkeley gulp worms with one 28 inch fish coming on leeches. We fished in around 10 fow most of the time but spent time in some areas going deeper. (20 to 30) when necessary .Every year around this time the fly's start showing up and over the years I have tried different remedies but the best one and the one I use is Horse Stable Spray. I buy Bronco equine Spray made by the Farnum company and spray it around in the boat periodically. Do not spray it on yourself but all around the boat. It works and you can fish without the company of these little pests. 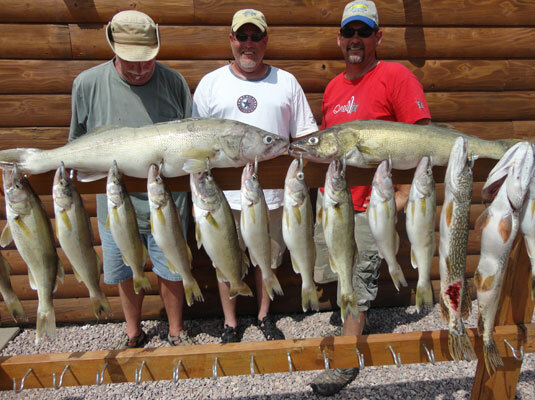 Fishing is maybe a little slower on Sharpe with a lot of smaller fish being caught but Oahe continues to put out numbers of walleye, smallmouth and northern pike with all presentations working. Salmon fishing is slow. Boat traffic is June busy with anglers everywhere and most catching limits. Lots of boats around and they are all catching a lot of fish. The bite for all species is excellent. The fish are biting just about anything you want to fish with. I finished guiding Larry Porters Wessal group from NE catching limits of walleye with many over's numerous small mouth and Northern and then went on to guide The Dale Vandyke family from NE. to limits of walleye, some nice northern and some small mouth bass. We caught these fish using bttmbouncer/minnows or crawlers with most of the bigger fish coming in 5 fow to 7 fow. We caught fish all the way out to 20 fow but it seemed that the deeper we got the smaller the fish From the dam all the way up the river to the 212 bridge you can have all the action you want but there are big numbers of 14 inch fish around so releasing them very carefully comes into play. Most boats are working out a 17 to 18 inch avg size limits with a few over 20 inch fish every day. 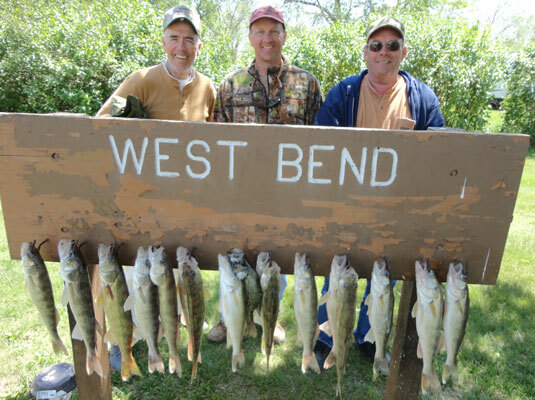 Sharpe is excellent also with the West Bend area producing lots of fish. I have been thinking about using more minnows along with Gulp as it also seems that you get less swallowed hooks on minnows. Once again I will mention that for the most part the fish in the areas I am fishing seem healthy enough but they are just biting all the time so even though I am seeing bait around a worry is there about bait hatches this spring. From my viewpoint it is just to good but part of this could be huge numbers of the 3 year ago walleye hatch making fishing easy. One nice thing is this year you don't seem to see big groups of boats all in one spot indicating every one catching fish just about everywhere. 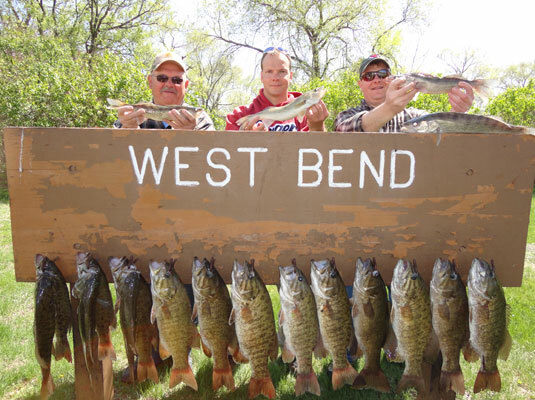 It is hard to believe the bite could get any better for numbers of walleye and the small mouth bass are going again. 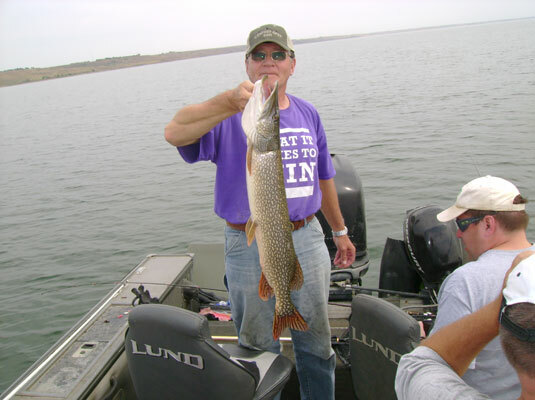 Lake Oahe is just full of a 3 year class fish that are all around 14 to 15 inch fish so catching big numbers of these fish and releasing them is common. 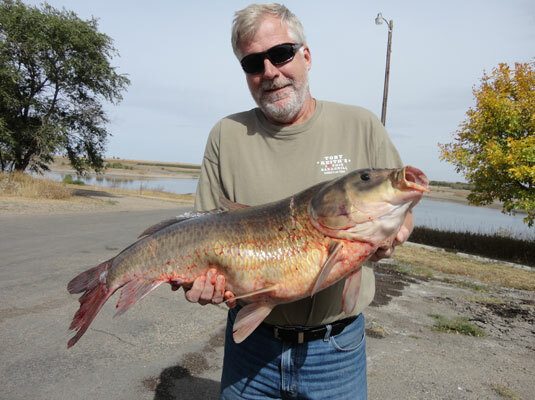 Keeping limits of 17 to 18 inch fish with limits of over twenty inch fish not uncommon. The fish are biting just about all baits from artificial to minnows/crawlers in any where from 5 fow to 20 fow. 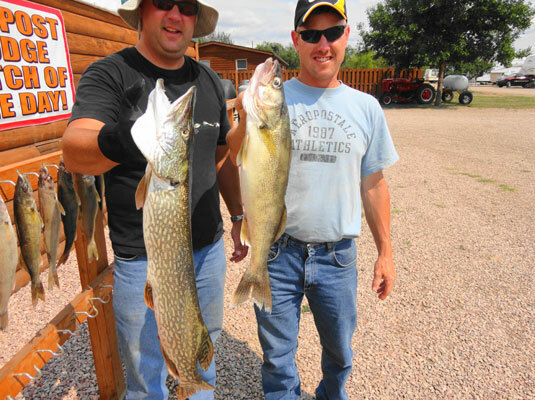 I fished repeat customers Gary and Dale Loske of NE. to possession limits of walleye some northern pike and small mouth bass with constant action both days releasing at least 50 plus walleye a day to get a nice 17 to 18 inch average size. I then fished a the Duane Wissel group from Lincoln NE with Larry Porter to limits of walleye all over 17 inches with many over 20 inches. We caught at least 75 walleye to do this. I cut a lot of hooks releasing the little 14 inch fish and I think they live but I we switched over to using only Berkeley gulp crawlers and gulp minnows at mid day as the fish seem to not swallow the hook as much and bite these just as good as crawlers. The best ones to use are the Gulp 3 inch pumpkin seed fry's on a plain hook or the new gulp spinner crawlers on spinner rigs We caught all the over's on these and the plus is less swallowed hooks. I think this presentation or pulling spinners with crawlers/ gulp crawlers might be the best way to catch the walleye right now as spinner fishing also gets more fish hooked in the lip making for better releases. Pulling plugs also has this advantage and the way these fish are biting right now I think being very careful with releasing fish is a must or we are going to have a lot of floating fish and no one wants that. Any fish that floats when I am guiding we pick up and keep and count in our limits even if it is small. This leads to being extra careful and trying to find ways to catch them without a mortality rate. The fish that we are catching seem healthy but very hungry leading to concern on many of us guides part about less bait in the lake and a lot of fish but I am still waiting to see what GFP surveys indicate about bait hatches before coming to any conclusions about problems. I have been seeing more clouds of some bait in many areas I am fishing There is going to be a huge harvest this year for those fishing Oahe/Sharpe so if you are looking for a lot of action this is a good year to head up. Fishing on both Lake Sharpe and Lake Oahe in the Pierre area has remained excellent with just about every one who knows the lakes catching limits daily .I fished a nice retired couple from NE Richard and Luree Wiese to possession limits of walleye keeping around a nice 18 inch avg size fish and throwing alot of smaller fish back. Caught these fish on crawlers in 15 to 20 fow. I then guided the Bob Starososka group from around the Omaha area to their possession limits of walleye keeping around a nice 17 to 18 inch avg. size fish. 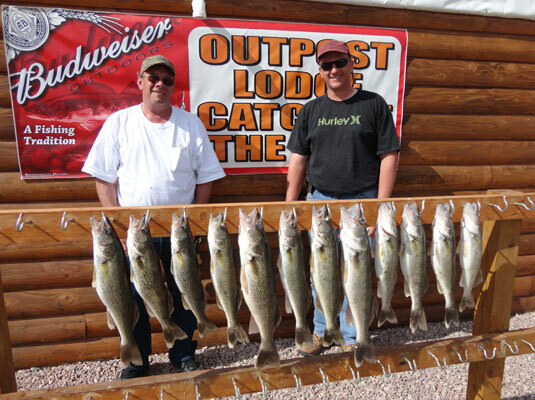 We caught these walleye on bouncer/crawler rigs in 10 to 20 fow. The bite is good on both minnows and Plugs also so if you like trolling you should do well .Starting to see more boats around as we get into June and this year should produce a great harvest especially of eating size walleye for everyone with knowledge of walleye fishing. Another quick warning. Take your time the first time out on both lakes as lower water on Oahe has all kinds of new rock piles a foot or so under water and last years record releases creating sandbars all over Sharpe. June is busy so if you haven't booked rooms/ cabins or camping spots better check into that. The fishing for all species except salmon is excellent but spring weather (windy days) causing uncomfortable conditions. I guided Mark Morton and family from NE. 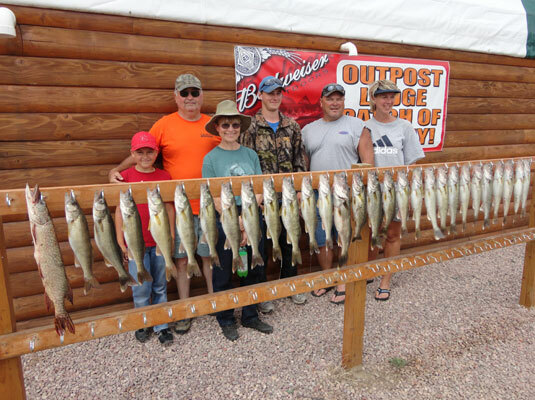 to possession limits of walleye and some smallmouth and northern on Oahe catching over 70 fish and keeping limits of 18 inch avg. size fish with son Tyler catching the big fish of the trip a 27 incher. We caught these fish on Oahe around the Cheyenne river area in 7 to 10 fow on bouncer/crawler rigs and the new Berkeley gulp crawlers. We caught just as many and the biggest fish using gulp. I then guided Don and Nat Klatt from Mn. on Oahe using the same methods but they got unlucky with one day producing 35 mph winds. We caught limits of walleye but that day kept smaller fish (15 to 17 inchers) The next day was windy but not as bad and we did much better keeping limits of around a 18 inch avg. walleye with a couple of nice over's to 23inches. 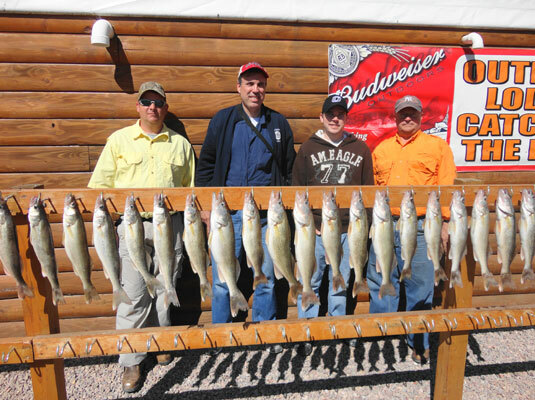 We also caught at least 50 walleye releasing the smaller fish. A couple of great guys and we had a great time. I then took Terry Williamson and his wife from down Georgia way out in another 35 mph wind. We decided to fish the big bend area of Sharpe to stay out of the wind as much as possible and that worked as we ended of catching limits of 17 inch avg. size walleye with 2 over 20 inches. Again we probably caught and released well over 50 fish to do this so Sharpe is going great also. We caught these fish on crawlers but in around 15 to 20 fow. This brings me to mention that I went through around 25 light wire hooks on these trips because many of the little fish swallow the hook and the only way I know to give them a good chance to survive is buy cutting the hook, leaving it in the fish with maybe 6 inches of leader. I am going to give Berkeley gulp another plug. I have noticed that almost all the fish we were catching on gulp were lip hooked so were released without cutting a lot of hooks. A real plus making this stuff a great way to catch them. I cut there new long worm in half and fish it on a plain hook and have no trouble with hook sets and they bite these artificial baits just about as good as crawlers. Because of the release factor I am going to use this presentation more this summer. I favor there pumpkin seed worm but cutting the longer ones in half gets the size right for our Lakes. All presentations like spinner fishing and plug fishing are working. A windy but great fishing memorial day week end. The bigger female fish are for the most part over the spawning recuperation period and starting to bite producing some real nice stringers of fish on Oahe. I guided Luke, Jake, Will and Dave Gideon from Burwell Ne. 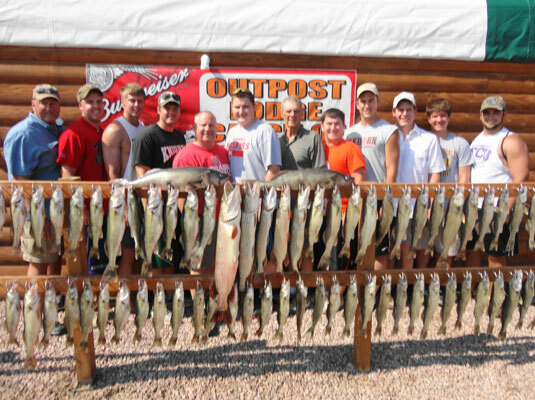 to an example of this with them catching possession limits of walleye with all of these boys catching there over fish (23 inchers) and throwing back at least 40 fish or more to end up with the rest of there slot fish running 18 to 19 inches. We caught all of these fish in around 5 fow to 10 fow drifting night crawlers. I then guided Bill Sterrup and his son to nice limits of both walleye and smallmouth bass but this trip was in big time wind (40 mph gusts) so we quit fairly early to get off the lake. All of these fish seemed to be healthy but hungry and easy to catch. 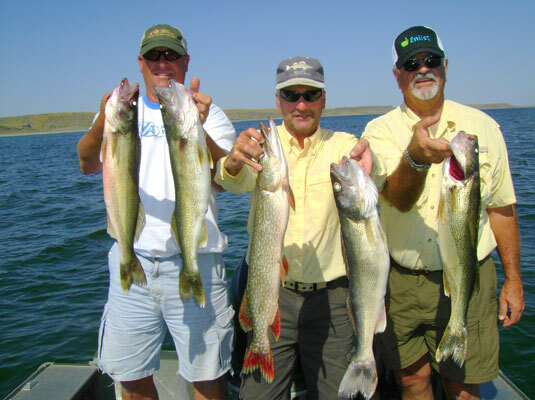 The walleye, northern & catfish bite is excellent on Oahe with the better area's being from the Cheyenne river up to the 212 bridge. Most fish being caught on bttm/bouncer crawler or minnow rigs but both jig fishing and trolling plugs are working. Staying shallow seems to produce bigger avg. size fish but there are fish in 17 to 20 fow. Lake Sharpe is still very good from Pierre down to the Big Bend area with crawlers working there also. I have no information on the salmon bite but I believe it is not good. I finished guiding the Wilke group for the Outpost Lodge and the guided Doug Hays and Doug Kelling from the Kansas City Mo. area. Two great guys that hit one bad day of weather (rain and wind) and one perfect spring day. Had limits both days but the last day they had really nice fish with all there over's to 23 inches and a solid 18 inch avg. We caught these fish in 5 fow to 10 fow on crawler/bouncer rigs or pitching Berkeley Gulp onto the bank on Oahe. 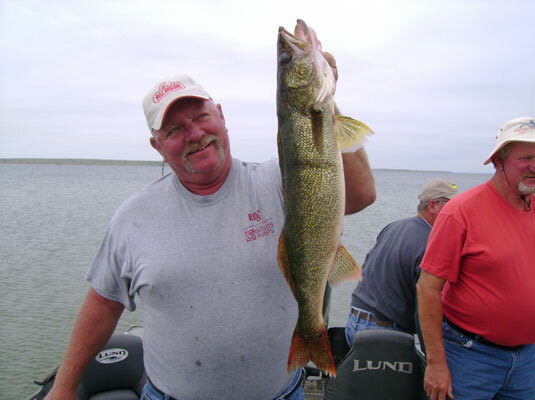 The fishing is getting even better as the bigger female fish are coming on bite making for a lot more over twenty inch walleye in limits that most boats are getting. The big bend area on Sharpe all the way to Pierre is good but I think the smallmouth are starting to spawn in some areas making fishing for them a little tougher. From the Dam up to the 212 bridge those that know Oahe are catching plenty of fish with less limits coming in from the Cheyenne to the Dam The Cheyenne river up to the 212 bridge has a better bite for walleye right now due to shallower warmer water temps .Minnows are working but crawlers starting to be a very good choice. Pulling plugs is also producing for those that prefer that method. 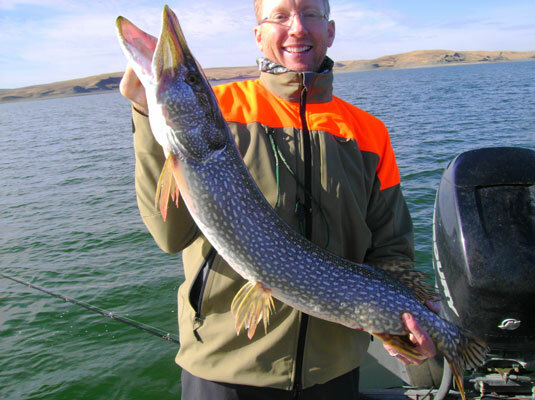 Northern Pike fishing on Oahe is excellent also with occasional 15 to 20 lb. fish being caught along with lots of smaller northern. Catfishing is good but Salmon fishing way off. Once again if this is your first time out take your time as new sand bars on Sharpe from last years record release's and lower water level's on Oahe have created plenty of danger area's and losing a lower unit can spoil a trip in a big hurry. Guided Patrick Purcelik and his friend Kirby from Whiting Iowa to three great days of both walleye northern pike and smallmouth fishing and my friend Jerry Fennell from Wisconsin on there last Day. We had really nice fish with all there over's every day. Fished in 10 fow in the Cheyenne river for 2 days with both crawler and minnows on bottom/bouncers then went down to the big bend on Sharpe on day three as they were heading home. Same results there with easy limits of walleye and some smallmouth with the same presentation. A really great bunch of guys. Then helped guide the Wilke group out of the Outpost Lodge on Cow Creek. All of the guides went to Bush's Landing for limits for everyone for two days. Most fish caught in 10 fow or less on jig/minnow or bouncer minnow with plenty of over fish along with a lot of northern pike and smallmouth. 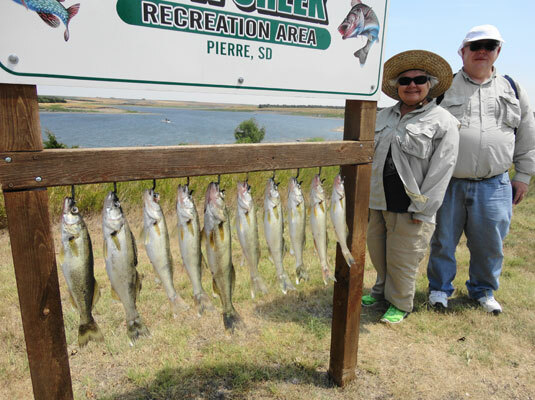 Fishing is excellent on both Sharpe and Oahe in the Pierre area. Weather has been good but some spring storms and some wind coming up. Salmon bite poor. Catfish good. 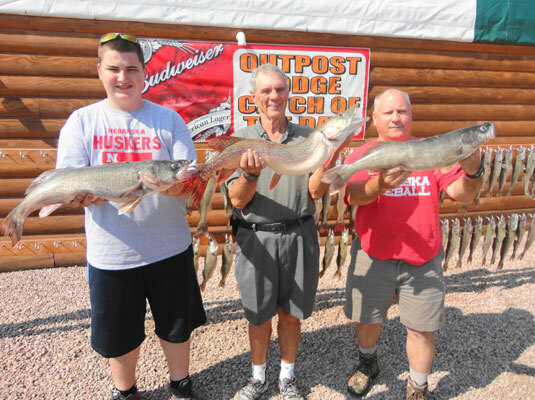 I guided repeat customer Bill Doc Leonard, son Doug and grandson Cooper from Atlantic Iowa to two great days of fishing on both Lake Sharpe and then on Lake Oahe. The weather was great and the fishing excellent with them catching possession limits of smallmouth bass, walleye and some northern to take home. We caught the fish on Sharpe drifting bttm/bouncer minnows and did the same on Oahe. The walleye on both Lakes are for the most part shallow (15 fow or less) and moving away from spawning grounds making finding them a little more difficult but they are biting so most boats out are doing limits. We are starting to catch a few more of the spawned out female walleye (larger fish) on a more regular basis and I think that bite should be in full swing in the next 10 days. Crawlers are working on lindy or bttm bouncer rigs along with pulling shallow plugs on both Lakes. There have been a few of the boat ramps like Bush's Landing that have had some problems with silt but GF&P have them cleared out now and as far as I know all ramps in the Pierre area are open. Be careful when first going out though as places like the Little Bend ramp have real danger spots when you motor out of the bays. If you are fishing for the first time this spring both Lakes have plenty of new hazards over last year. 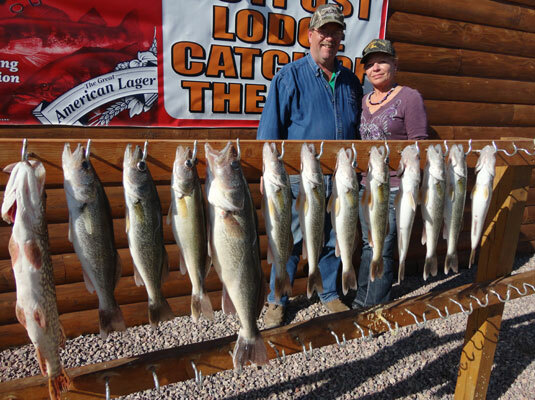 Guided Bill Corn and his new bride Lucie on Sunday to limits of walleye with them getting both of their over fish and keeping the rest of there limit in the 17 inch range with one nice northern and many throw back fish along with some smallmouth. 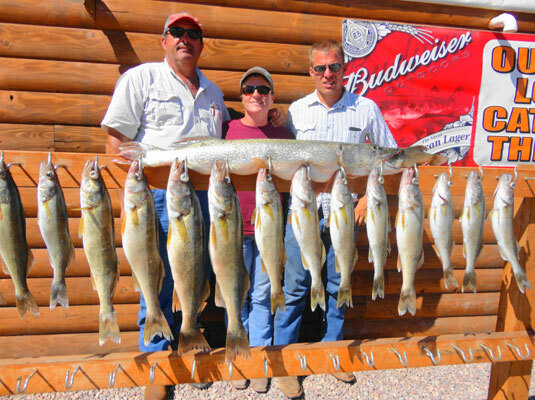 Caught them bttm/bouncer minnow fishing in the Cheyenne arm of Oahe in around 10 fow. A beautiful spring day in the 70's with no wind so they got lucky as did the Leonards. 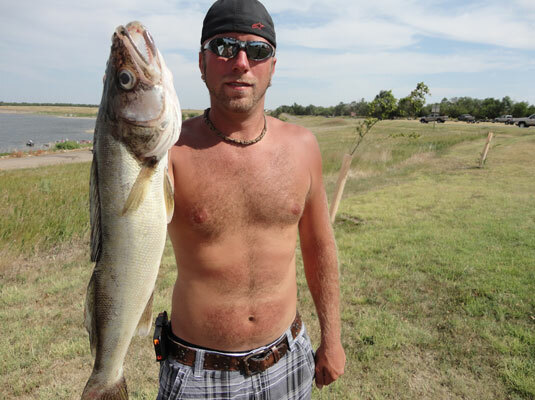 The bite on Sharpe and Oahe remains excellent and should continue to get even better for the walleye as the bigger female fish recuperate and move into the shallows to feed. I guided Chuck Harkins and his wife from Miller for two days, catching limits of walleye on Sharpe then some catfish and Northern on day two. 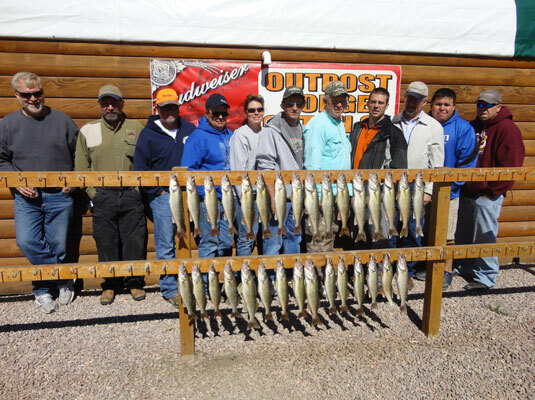 The May weather didn't favor their trip with high winds dictating the fishing. A real nice couple and we all had a good time. Caught the walleye in around 10 fow and the catfish and northern in less than 5 fow on Oahe in 35 mph wind on dead smelt. I then fished Steve Graycroft and his wife from Gettysburg and his brother and uncle from Kentucky to limits of smallmouth bass and walleye in a little less wind (around 25 mph). 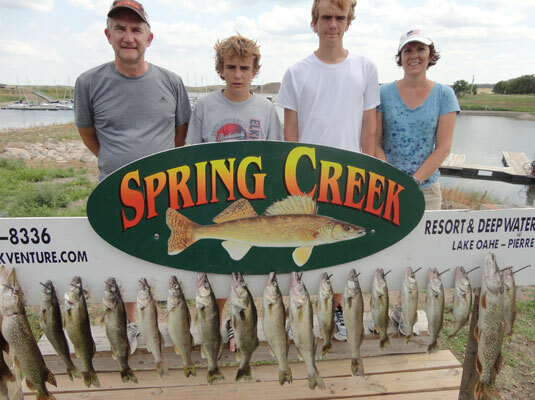 Another great bunch and they had three master angler bass (over 18 inches) with wife Sonja catching one over 20 inches. 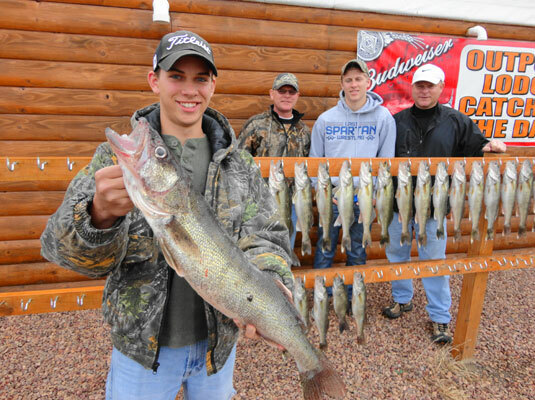 The walleye averaged around 17 inches. Caught these at the big bend area in 10 fow. All of these fish were caught on bttmbouncer/minnows as that was working better in the wind. Early spring fishing is weather related and sometimes you have to work to get limits and these two trips were that way. I then guided repeat customer Tom Main from Rapid City and his 98 year old Dad, (that's right 98) a real trooper, to limits of walleye, some northern and a few crappie on the Cheyenne river on a 75 degree day with very little wind. Caught these fish on bouncer/minnows in around 12 fow. The bite on Oahe is still good with a lot of the fish moving away from the spawning area's so looking for them is a little tougher but most fisherman getting limits. I was asked a couple of questions one being about the current water level on Oahe. I think the pool is around 1605 with 1620 being full pool. We still have plenty of water but are down around 15 to 20 fow from record pools of last year. I had a question about baitfish and the health of the fish. Although I feel it is too early to tell I haven't really noticed any unhealthy walleye where I have been fishing. I have noticed some of the smallmouth looked a little stressed at the Bend area on Sharpe. The fish seem easy to catch. I think everyone is concerned and probably it will be further into the months of July and August before there well be any real solid information about the effect of the high releases of last year. You might get more reliable information about this from GF&P as they had a series of meetings and have that filmed on one of there sites. They have a lot more reliable information than I can provide but I well try and update any info I hear. I am marking plenty of bait in the areas I have been fishing but am not sure about what kind. I do not know of any smelt run around my area. 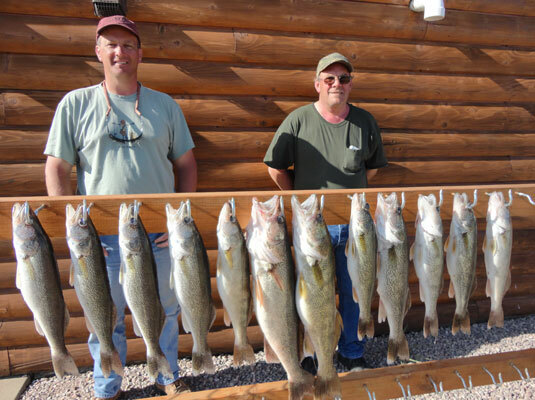 Fishing on both Lake Oahe and Sharpe still going strong around the Pierre area but the spawning walleye males are starting to thin out around the spawning beds and migrate to were the bait fish are on their way to summer areas they use. May weather turned to some wind/rain days so the roads to boat ramps on gravel have been muddy. This has been the main reason I fished Sharpe around Pierre this week guiding repeat customer Troy Swift, his Dad and friend to limits of walleye catching all of these fish on the river bluffs around Pierre A great bunch of guys and we had a real nice trip..Caught the walleye in 10 fow pitching jigs/gulp or dragging bouncer/minnow rigs I then fished a small tournament with Jon Sailer. 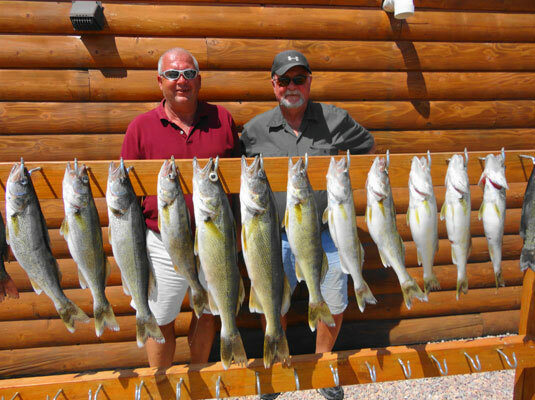 Both of these trips we caught maybe 30 to 40 walleye a day mostly in the 15 to 17 inch range with an occasional 18/19 inch fish. Plenty of fish still being caught on Oahe with males in the most part starting to move off spawning beds also and you can start looking for them along with the females a little deeper (20 fow) and around warm water flats close to the spawning areas. Minnows still the main bite but I am starting to take crawlers along as that bite should be starting and is going down at the big bend area. 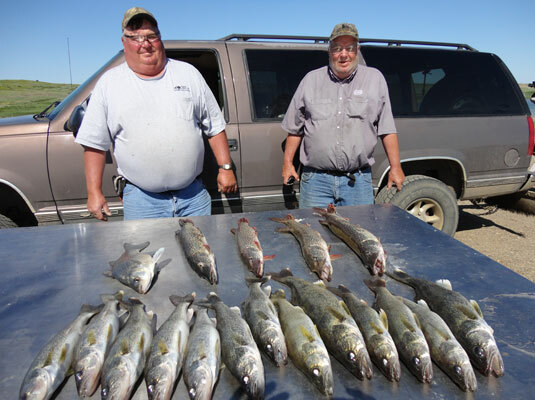 Northern fishing still very good on Oahe mostly in shallow water, Cat fishing good but Salmon bite is poor. Trolling plugs is working along with live bait presentations for all species so if that is your style go for it. Remember to keep an eye on depth finders on both lakes as sand bars and lower water have made for some real danger spots from last year. I finished out the month of April guiding Mike Holen from Loomis Ne. and Joe Cipov from Rocklin CA. to real nice limits of 17 to 18 inch avg. size walleye and a few white bass on Lake Sharpe. 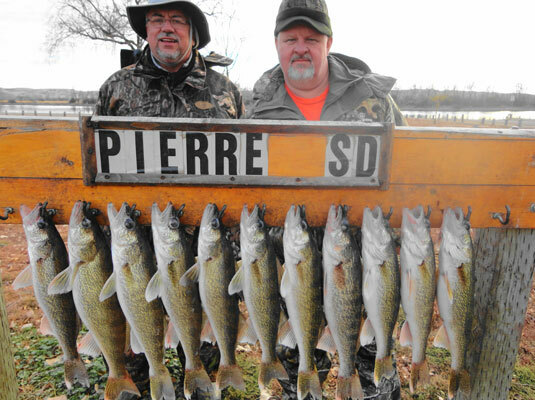 We fished the Pierre area looking for males that are staying around the spawning area's. We caught around 40 fish releasing the one's below 16 inches. For the most part we caught these fish in shale/pebble rock areas in around 10 fow either dragging or pitching jig/minnows or Jig/Gulp. 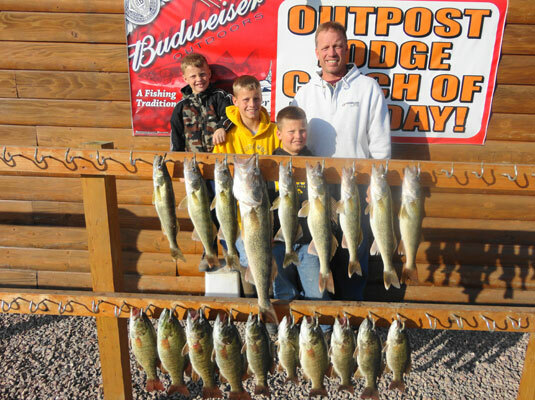 The weather was 70 degrees and very little wind so these guys got lucky and had a great trip .Sharpe is going strong for both walleye and small mouth from the Pierre area down to the big bend area with most of the action shallow. 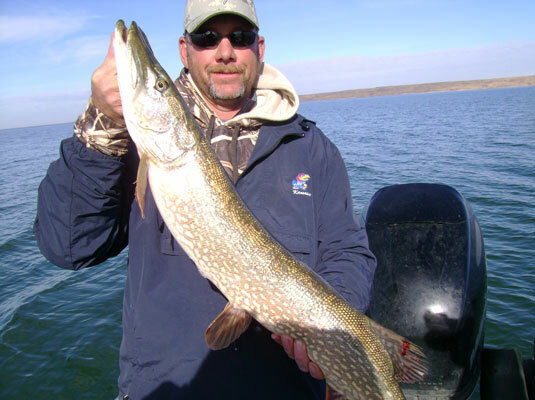 Lake Oahe continues to put out great action for walleye and northern pike for those who know the lake. All the major creeks from the dam up have action mostly in the warmer stained water usually found further into the creeks and back of bays. Northern/cat fishing on dead smelt and cut bait very good along with spawning walleye males .My reports usually cover Lake Sharpe from the Big Bend area up to the 212 bridge on Oahe. Weather report looks pretty good for most of the week so I expect to see a good number of fishermen out and will have next report out in 3 days or so. 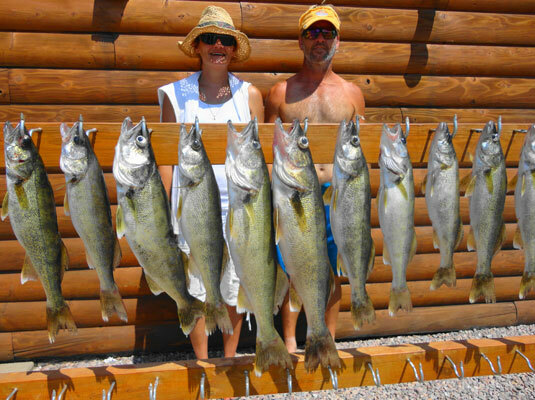 Walleye/Northern fishing is excellent on Lake Oahe and also excellent on Lake Sharpe for spawning male walleye. 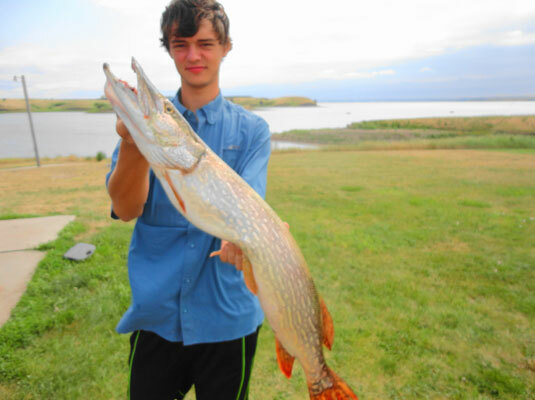 The Northern Pike fishing and cat fishing is also very good on Oahe. Most of the action on Oahe is in the back of creeks with running water and the Cheyenne river. On Sharpe both the downtown area and Big bend area are going strong. I fished friends Gary Howey of Outdoorsmen Adventures TV and Larry Myhre retired Sioux City Iowa Journal sportswriter/Editor the 24th 25th and 26th filming for Gary's Show and some articles for Larry. 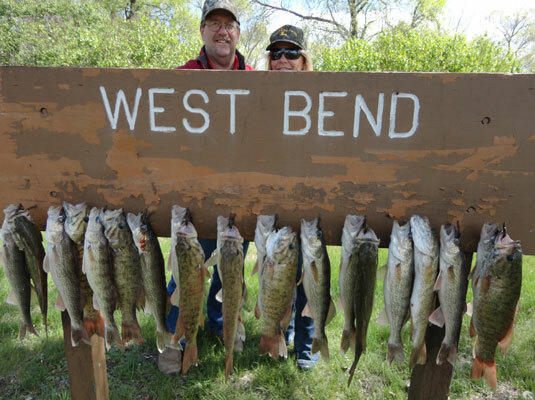 We had constant action both at West Bend on Sharpe catching walleye and smallmouth all day on Tuesday and also on the Cheyenne River on Oahe on Wednesday. 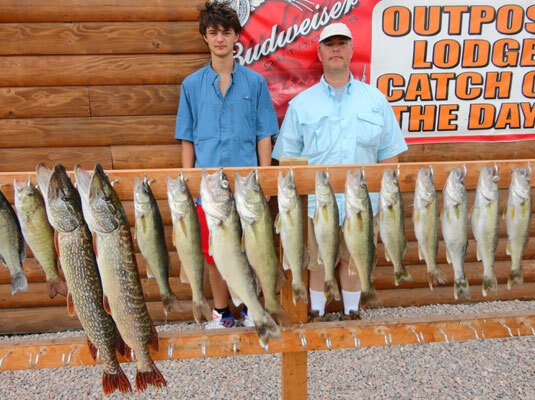 We caught both walleye and northern pike. Probably caught and released a total of well over 50 fish a day on both places with almost all of the walleye 16 to 18 inch males. The northern were from small fish to several in the 15 lb range. Also had some smallmouth bass action. We caught all of these fish shallow in 10 fow up to the bank pitching jigs/gulp and jigs/minnow. We also tried pulling spinner/minnows on Sharpe and that worked too so you can catch the fish a lot of different ways including trolling plugs. 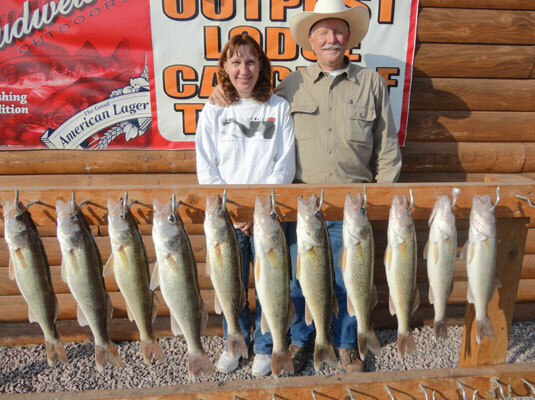 We caught very few female walleye and released those. The weather was really nice with 70 degree days and not much wind. Then I fished repeat customer Dave Petroco from Denver for 3 days. 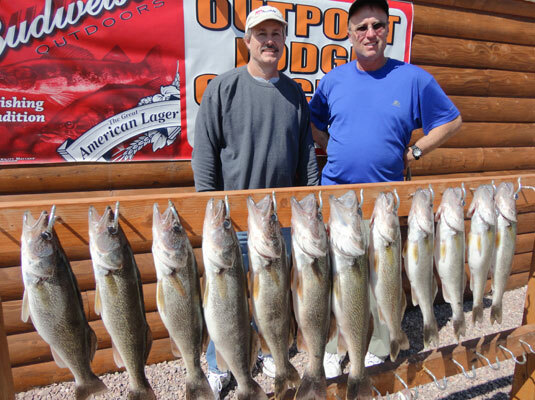 We caught limits of walleye daily but did the weather ever change with rain/ wind for 2 days. Spent Friday cat fishing to try and stay out of 40 mph wind/rain and caught some along with two northern but called it a day after sticking it out for 6 hours or so. Spring weather and that pretty well is the way it is in April. Great fishing but cross your fingers on the weather because it can go either way for you I had a great time with all of these guys. We caught a lot of fish and had three great weather days and two nasty ones. 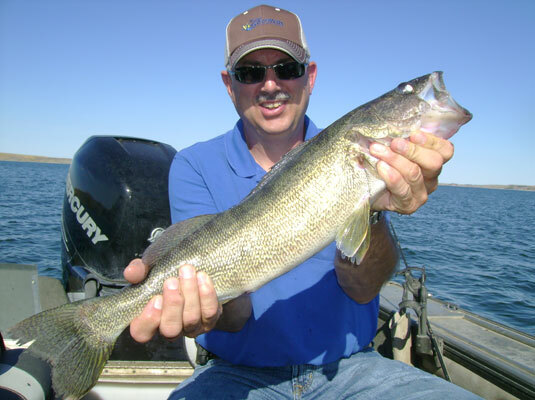 Looking for warmer stained water and shale/pebble banks is the key in the spring for the walleye or any area that you know the fish are spawning. Water temps over are 50 degree surface in back of creeks/ river but 40's on main lake. Take your time at first on both Sharpe(new sandbars everywhere) and Oahe (lower water than last year) present plenty of danger spots. No Salmon report other than and a few caught by accident below the dam. 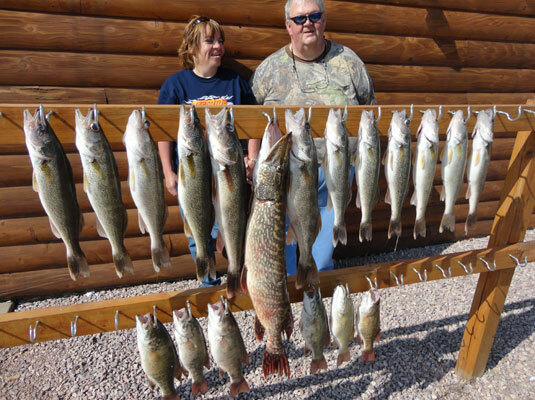 Fishing continues to be good to excellent on both Lake Sharpe and lower Lake Oahe for walleye, northern pike ,small mouth bass, and catfish with Salmon fishing poor. I guided Ron Pyle and his wife from Neligh NE. Friday Saturday and Sunday to their possession limits of walleye and small mouth along with a few northern and all the catfish they wanted so they had a nice cooler full of fish to take home along with some nice walleye for supper. 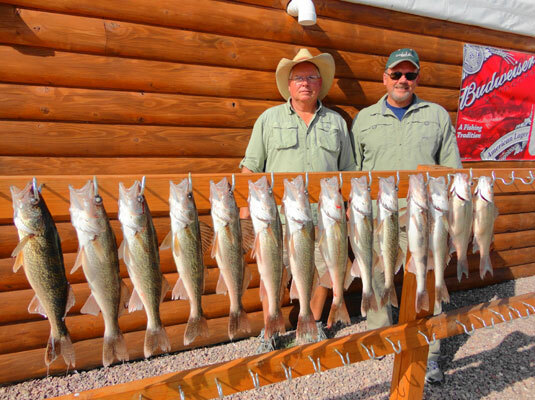 We fished the big bend area of Sharpe Friday staying in around 7 fow using Jig/minnow or rig/minnows and caught around 75 walleye and probably that many small mouth on a 65 degree no wind day with continuous action all day. The wind came Friday night limiting us to go cat fishing on Saturday to stay out of 30 mph wind with gusts to 49 mph. Spring weather. Could have caught a lot of catfish but kept 15 and a northern and went in early. Caught these in 3 fow on smelt in back of creeks fishing with slip bobbers. The wind blew thru and Sunday we went up on the Cheyenne river. Another great spring day with temps in 70's and no wind. We caught limits of walleye and a northern pitching jig/minnows and also rig/minnows all in 12 fow or less. 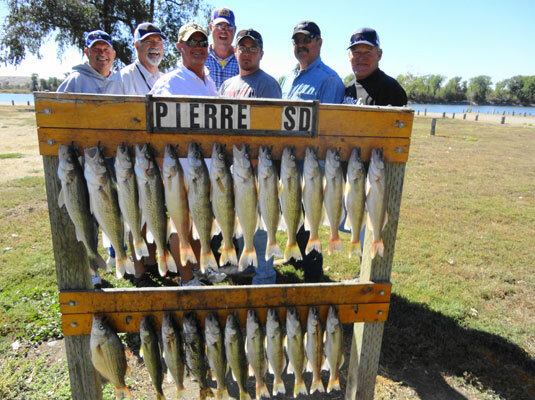 The bite is also good right around the Pierre area and when the weather holds there are lots of boats out and lots of limits coming in. Water temps at the bend are in 50's as they are in back of creeks and Cheyenne. Main Lake temps in the mid 40's.This next week looks like great weather and the fishing should hold as long as the weather does. The spring weather came into play over the weekend with Rain almost all day Sunday so not many boats out. Heard reports of some nice fish being caught on Oahe from the dam up to Snake creek on Saturday with over 20 inch fish common but not a lot of numbers. 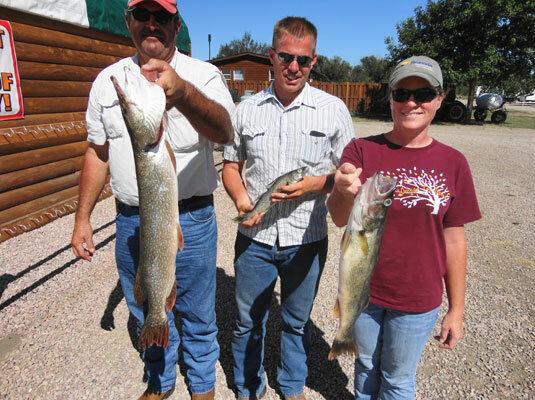 Sharpe continues to put out fish limits. I guided Troy Vanecek, Bob and Tim a fireman, deputy sheriff and Dad from Council Bluffs Iowa on Monday Tues and Wed. The weather was rainy/cool Monday morning so we started on Sharpe around Pierre catching 16 fish limits of walleye to 23 inch's both pitching jigs shallow and dragging lindy rigs in 15 ft. The main bite around Pierre on Sharpe is mostly drifting in around 10 fow with minnow/ Jigs/rigs. 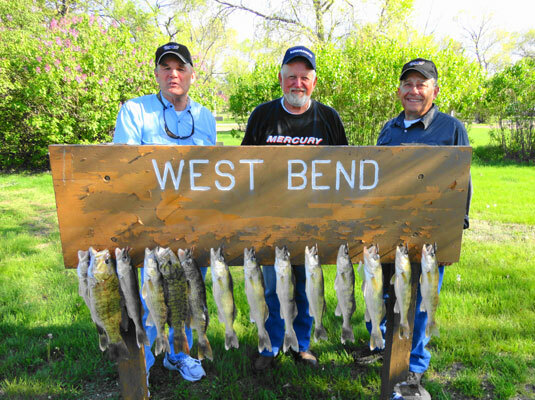 The second day was really nice weather so we went up on Oahe and fished in the Cheyenne river. The bite was good and we kept 16 walleye around a 17 inch avg.6 northern around 10 to 15 lbs and some nice small mouth. 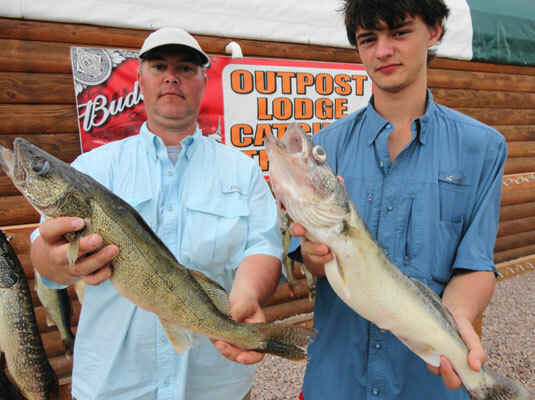 We probably caught at least twice that releasing the smaller northern/walleye. Caught the most fish pitching jigs/minnows into the banks but later in the day the fish mostly moved out deeper and we caught them in around 25 fow. The fellows were going to drive back to Omaha after fishing Wednesday so I took them down to Big Bend on Sharpe to go small mouth fishing as they only needed a few walleye ( after shore lunches) for there possession limits of walleye A beautiful no wind 70 degree day and we had constant action catching and releasing at least 75 walleye in the 15 to 18 inch range and that many small mouth keeping 20 small mouth. We caught all these fish in 5 to 10 fow. on jig/minnow/rigs. They went home with there possession limits of walleye/smallmoth bass some northern and a few white bass .A great trip for a great bunch of guys. Water temps at the bend were in low 50's. Much colder around Pierre and you can find 50 degree water in back of creeks/ Cheyenne river. The spawn at the bend is in full swing and we never caught a female there Above the dam in the colder water I think it is just starting and I think it is maybe it is midway up river on Oahe. The smelt run should be starting soon on Oahe Salmon fishing is slow..Remember to take your time both on Sharpe and Oahe as water conditions have changed since last fall and there are danger spots around on both lake's. Looks like a real nice warm up next week so expect to see more boats around making for a real early season. The weather all winter has been record setting with above average temperatures the norm .27 days above normal in March There have been more boats on both Lake Sharpe and Lake Oahe then I can remember and most fishermen are catching limits. 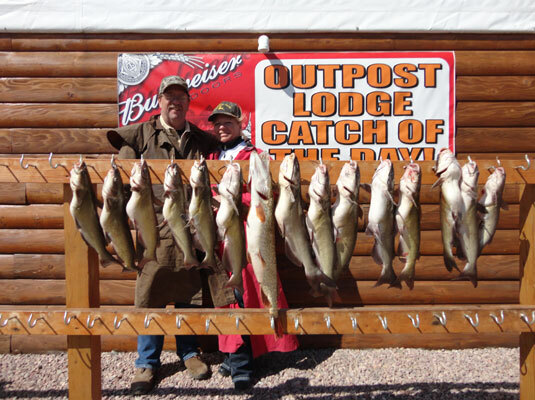 I fished up on the Cheyenne (Oahe) two days last week and both days produced limits plus. The nice part of these trips were the amount of big fish that we caught and released. 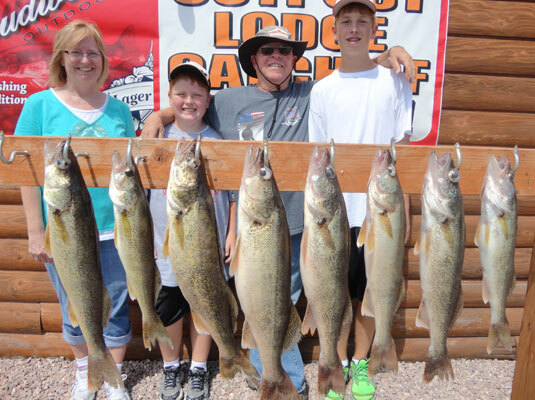 On Wed. four fish over 24 inches with one over 29" We kept limits of avg size walleye around 17 inches for supper. Caught all of these fish pitching Berkeley Porgy's shallow but saw fish being caught all the way out to 35 feet deep on bottom. bouncer/minnow presentations. We also caught around 10 northern a day but none over 15 lbs I heard about someone weighing in a 28 lb northern Thursday so plenty of these bigger ones around. Catfish excellent in very shallow water in back of bays/creeks on cut bait/smelt. .From the dam up is putting out fish on Oahe but since they are in all depth's it is tougher to find them. Those who know the lake are doing well. For this reason I will call Oahe as good to very good. 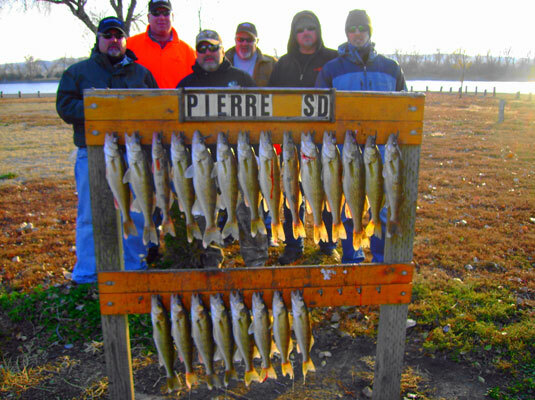 Sharpe continues to put out excellent fishing with a lot of nice sauger in the 19 inch range along with walleye. 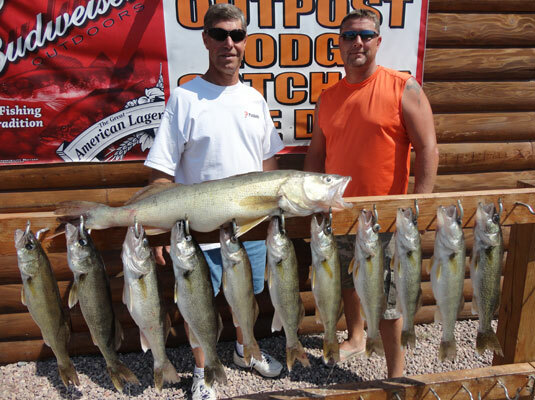 Most fish in 15 feet or more but many walleye are being caught pitching into shallow water. Trolling plugs shallow, dragging or pitching jigs with minnows or gulp all good and most common. 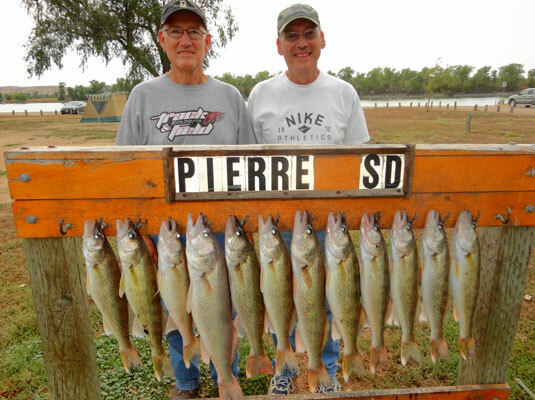 From Pierre all the way down to the Big Bend good to excellent Take your time on both lakes as new sand bar's all over on Sharpe and lower water on Oahe makes for many danger spots. I will do one report or so a week now until May and then do at least one every 3 days I will start putting pictures in report next week. Have a nice Easter. 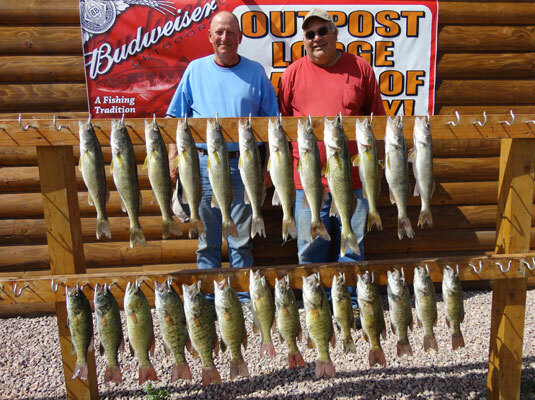 It is earlier this year but I am going to start my fishing report for both Lake Oahe and Lake Sharpe as the weather is early spring and the fishing is excellent. 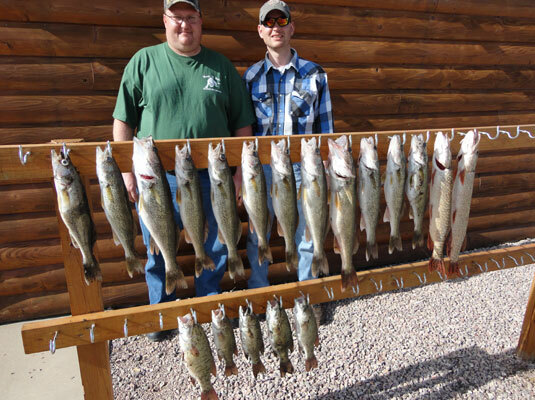 Last Saturday I went down on Lake Sharpe with Jon Sailer and fishing in 75 degree no wind weather we boated around 50 walleye /sauger in the 18 inch range from around 10 in the morning to 3 o'clock. We caught most of these fish in around 15 to 20 ft holes right around Pierre on jig/minnow combination but we also pulled some flicker shads shallow and caught them that way to. There are a surprising amount of boats on the water but the weather is so good everyone is out early getting some fish for supper. Excellent fishing all up and down Lake Sharpe so if the weather holds you can have a great trip .Be care full and take your time on Sharpe as new sandbars everywhere since last years flood. I got up on one myself going where I have been going for 30 years. 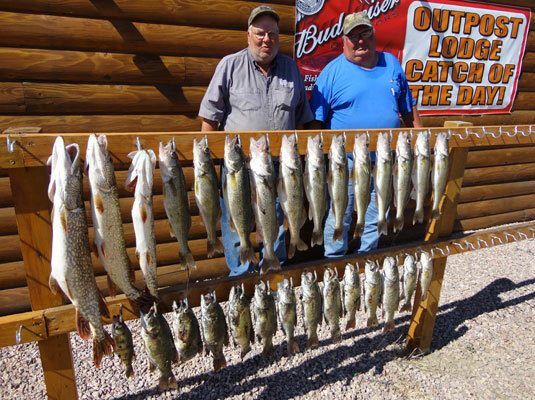 Lake Oahe is also putting out numbers of both walleye northern pike and catfish. The dam all the way up to and including the Cheyenne river are good to very good. Most walleye are around 30 ft and dragging a jig works best but pitching into real shallow water is also producing limits and is the best way for northerns along with walleye. Because some fish are still deep and some shallow finding them is a little tougher. Looking for warm stained water for pitching jigs tipped with minnows or Berkeley gulp (porgy's) is my favorite presentation. Looks like another great year on both Lakes. Still a little to early to say much about effect of the flood on fishery but the fish we caught were healthy and full of bait so I am hoping for minimal effect from the high releases of water last year Time will tell and I will comment more on this as the summer progresses. Oahe has dropped from last years flood pool so once again take your time at first on the big lake as there are some real danger spots and lower units are expensive. 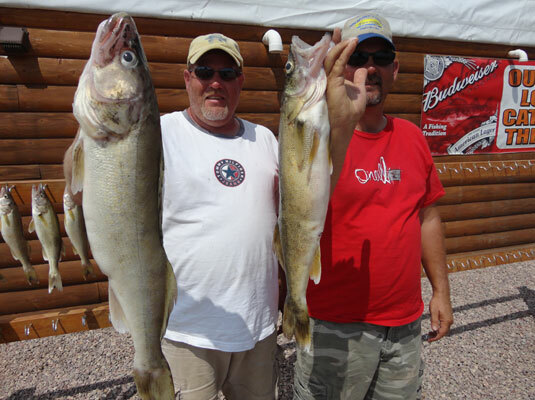 Both of these month's produce excellent walleye fishing along with great smallmouth/ Northern/ Catfish. Weather is a factor so many times we have to stay off big water because of high winds etc. but this is a great time to go after the big northern and catfish in the back of creeks/bays to beat the weather. 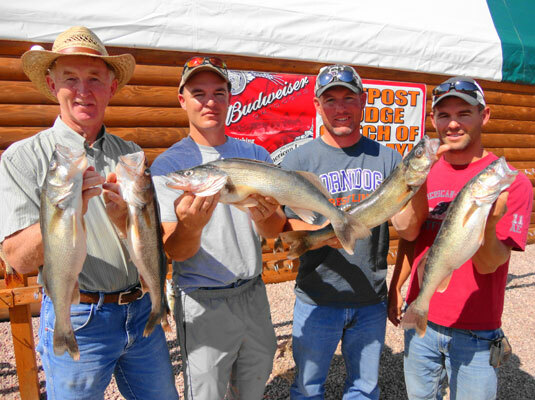 Also fishing on Sharpe below Dam keeps you out of wind and produce's nice limits of walleye. Jig fishing when water temps cold along with btm. bouncer presentations as water warms most common .Boat traffic can be much more around the Pierre area. By far the busiest month on both lakes. ( School out and just traditionally start of summer season] so book early if possible to get best guides/lodging. The fishing is excellent for all species. Weather can still be a factor. We are usually fishing with Lindy or btm. bouncer's. 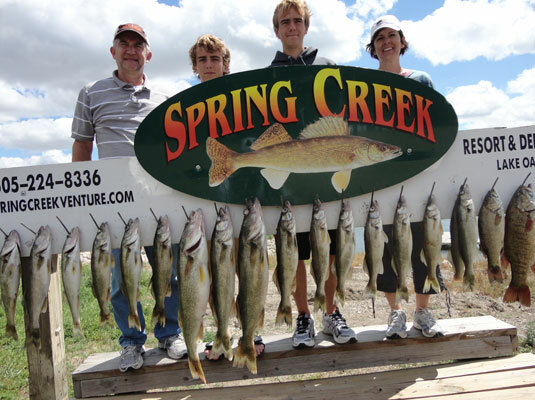 Best all around month for both fishing and weather especially family trips Walleye fishing at seasonal peak especially in high water periods on Oahe. and Sharpe good two. Btm. Bouncer presentations most common. Same as July but there can be hotter weather. If there is a breeze it is not to bad as big lake water temps keep heat down. Fish can be a little deeper but still great fishing. Very good on the walleye fishing with fall weather great toward end of month. As water cools jig fishing starts to come into play again. Fishing is still good but weather coming into play again Jigs work best especially in colder water. 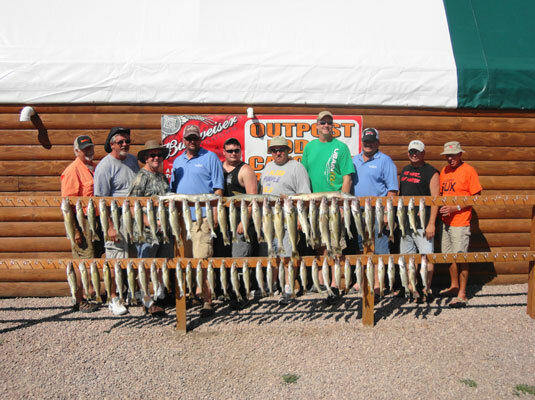 Combination Hunting /fishing trips most common. Just a note: You can catch fish in all the months above tolling or casting plugs and we do that often. But I have found that guiding people over the years most prefer live bait hover fishing better so I spend more time with btm/bouncer/crawler/minnow/leeches than the plugs but pulling plugs is always a good alternative and sometimes can be the best. The 2019 open water fishing season is here. Once again a big thank you to my 2018 customers for your business last year and in years past. You can scroll thru the catch's/reports tab above for previous years and see a lot of happy faces and also around a 100 % walleye limit success story. The thing I am the most proud of is the amount of repeat customers that you will see if you scroll back over the years. 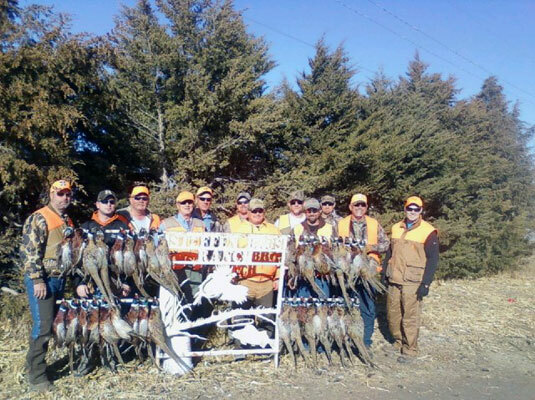 This is a real good indication of the kind of fishing/hunting we have in the Pierre area along with supporting my decision to start my guide service here years back. Just a lot of great memory's with a lot of great folks. Lake Oahe could be a little slower and more challenging on the lower end of the Lake. 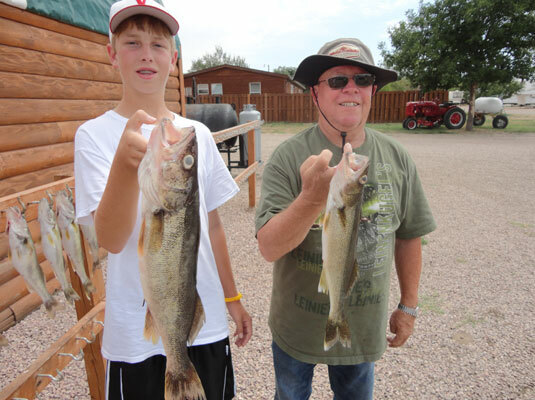 Walleye numbers appear to be less from basically the Cheyenne down to the dam but the further up river you go numbers of both bait and fish improve. To me this probably means I will spend more time fishing north of Pierre on Oahe, Most of the walleye/smallmouth fishing should be good for the good with most guides and experienced anglers doing well. Water levels should be high and that will help hopefully with a smelt run this year. Bait fish continue to be good on Oahe but a smelt run would really help the over all fishery. Lake Sharpe this year. Plenty of shad again makes this another great year on the small lake. 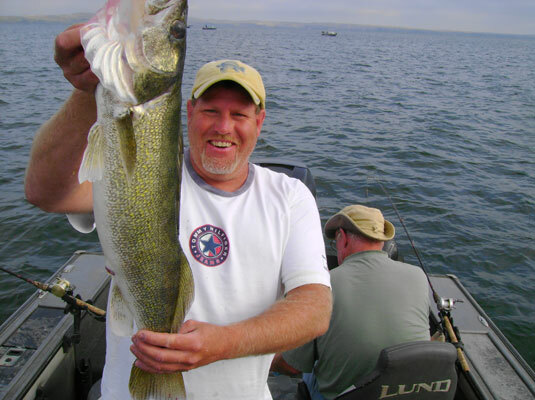 There should be plenty of over 15 inch walleye around making limits for the anglers spending time on the water very good. Smallmouth fishing should continue to be excellent however average size will be better on Oahe. Catfishing on both lakes will be great for those spending the time to fish for these guys. They are an under fished alternative and can make for a great mixed bag experience. Northern and white bass make for more eating fish limits on both lakes. I will continue to post the fishing catch's/reports pages as soon as I get on the water with an average up date every 3 days in the hope that this feature will help those of you who are planning trips. I will give general info on area's we are fishing ,depths we are fishing, and baits that are working along with picture's of the size fish we are catching. My hope is that you can use this feature to help you in planning a trip or saving some time in hunting the fish. 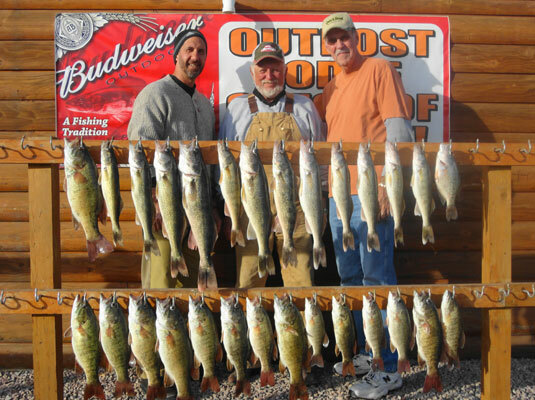 Lake Oahe/Sharpe in the Pierre area still continues to be one the best location's for the quality of fishing/hunting that is here for those coming from Nebraska, Kansas, Iowa, even eastern Colorado and eastern Wyoming. 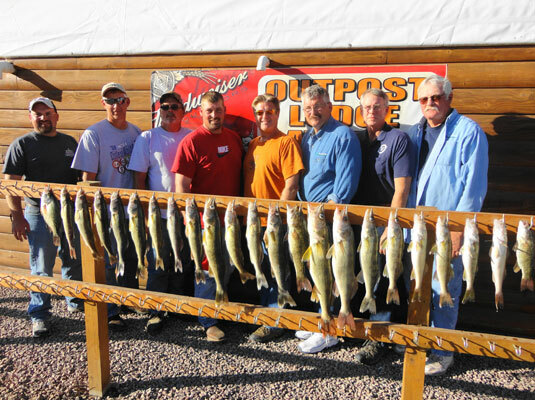 We also see a lot of Wisconsin Minnesota angler's over here so we hope you will come our way. There are also many other things to do while in Pierre. Information on my things to do tab will show some of these. If you need a licensed experienced ( 30 plus years and USCG CAPTAIN) guide service please give me a call or send and email and hopefully we can do a trip together sometime.